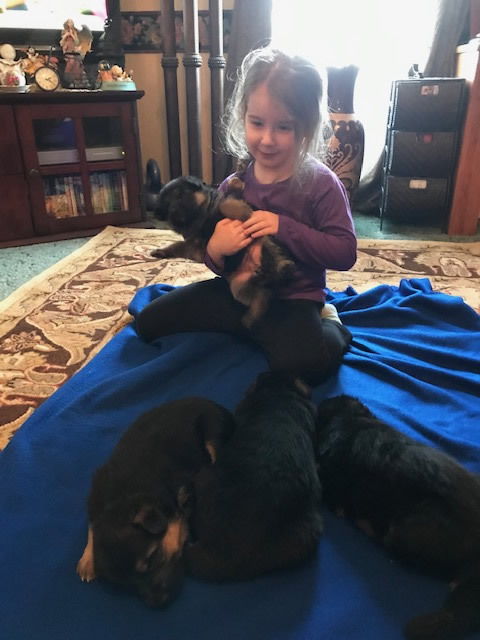 Ava x Ruger Litter Born February 14, 2019 !!! 6 Males & 5 Females Born on 02/14/19 !!! A big Thank you to all of my AMAZING Customers!!! 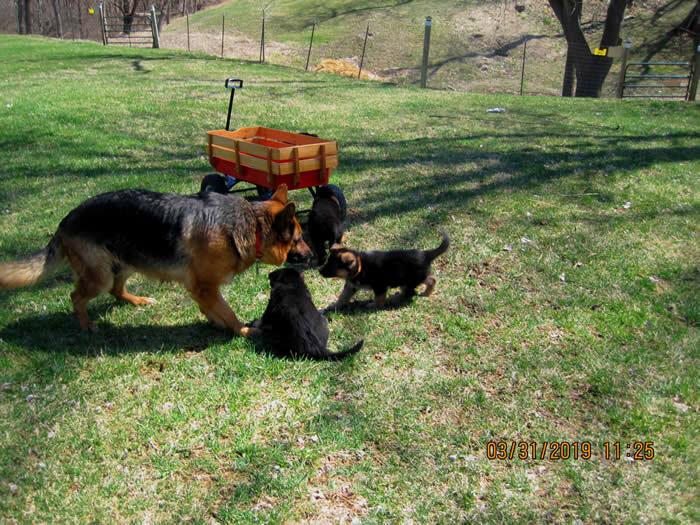 Big Beautiful Black and Red German Shepherd Pups..
Puppies will be ready to leave April 12, 2019 !!! 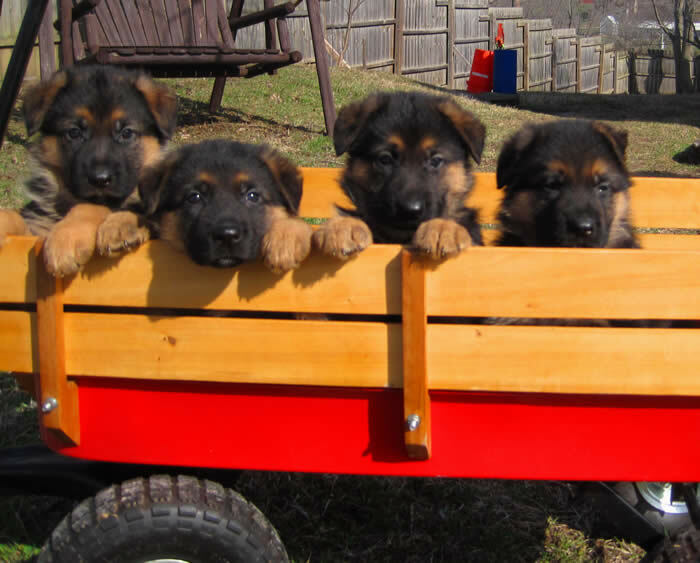 ALL puppies MUST be picked up in person at 8 weeks of age. 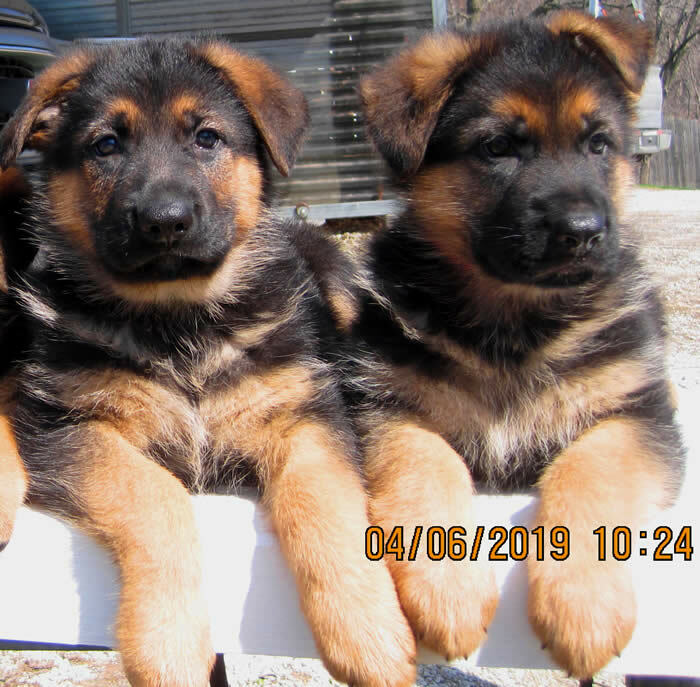 Puppies required pick up date is Friday, April 12, 2019. 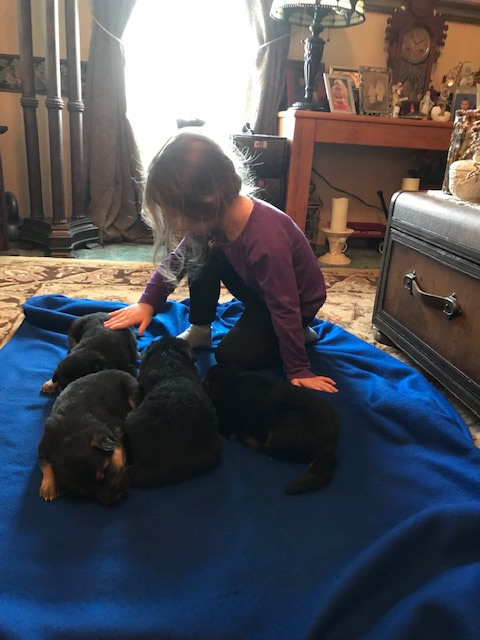 Their 8 week old birthdate is April 11, 2019, on that day they will go to the vet for thorough exam, vet health certificates issued in each buyer's name. 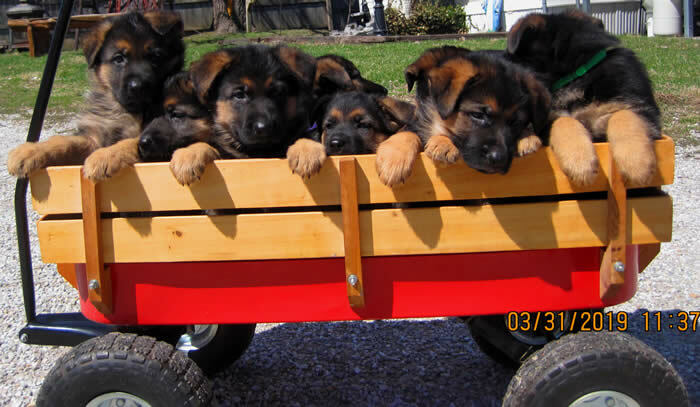 That night they will be bathed/groomed and ready for pick up the next morning. Mark your calendars !!! Scroll down for more information terms/conditions of deposit and requirements for pick up. Scroll down to see the Deposit list. Feature Photo...Scroll down to see more pics !!! 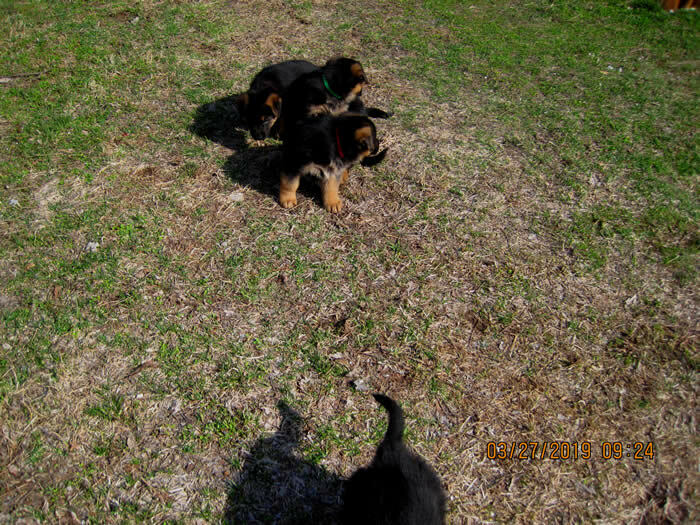 SOLD 8 week old Green collar MALE as shown in photo. 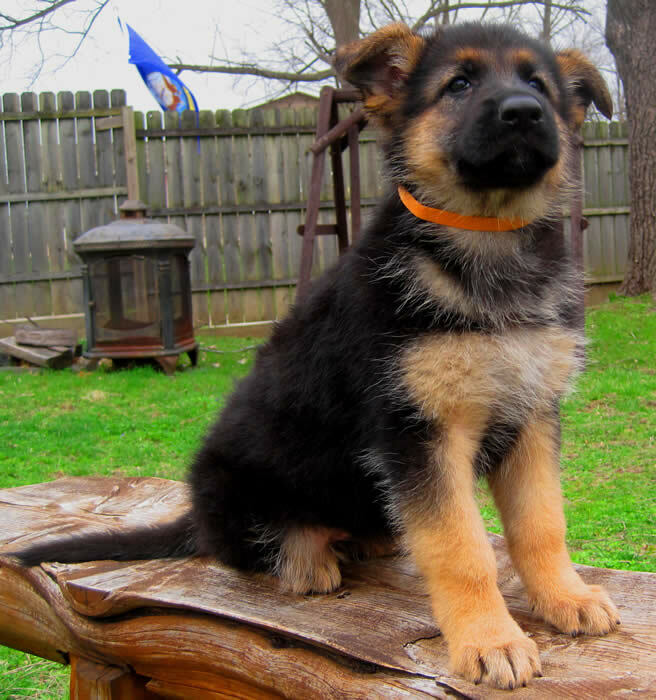 Photo taken 04/11/19 @ 8 weeks of age. He is a big boned, BEAUTIFUL male. 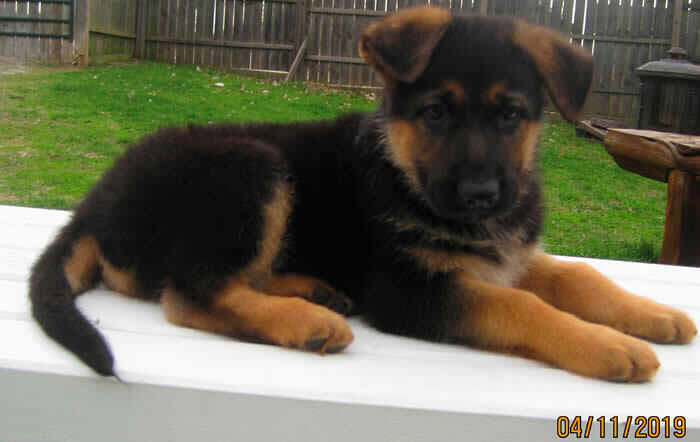 VERY sweet, loving, alert, confident, playful, investigative, precious adorable baby!!! He is UTD on vacc/worming. Vet health certificate issued. Extremely intelligent, his desire is to please. $1800 CASH. $300 deposit to reserve. Hurry as he won't last long! 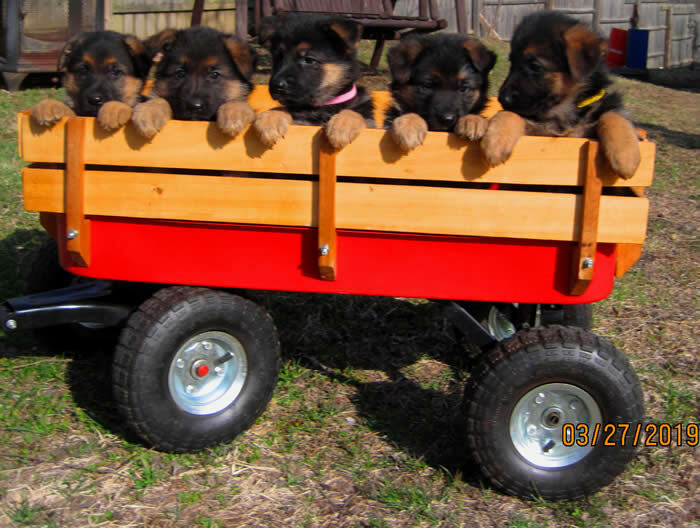 Scroll down to the bottom of this page to see more photos of the puppies !!! Ava is the daughter to our imported Champions Ben vom Bonihaus x Bella !!! We kept Ava back and hand raised her since birth. 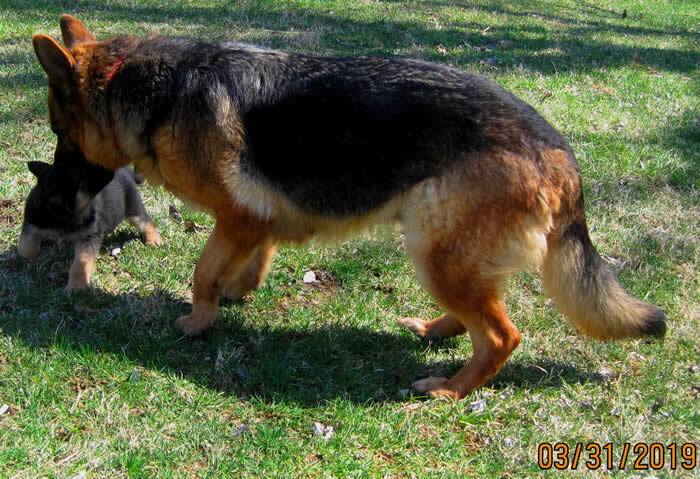 Ava is an Exceptional dog and super mom to her puppies!!! 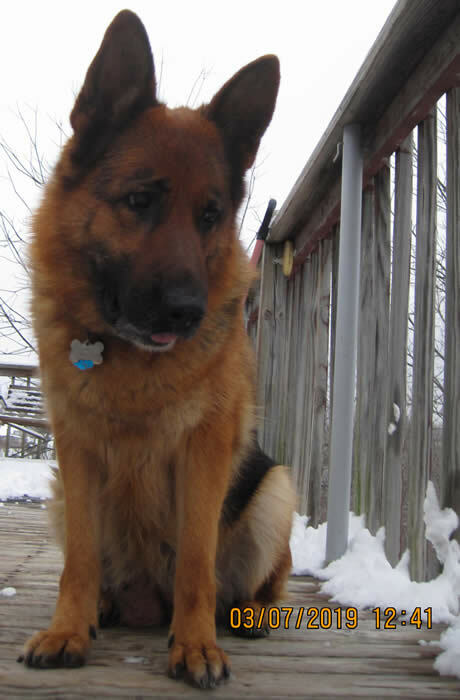 You can see Ava's parents which we owned, Ben x Bella by visiting the "Our Dogs" link. 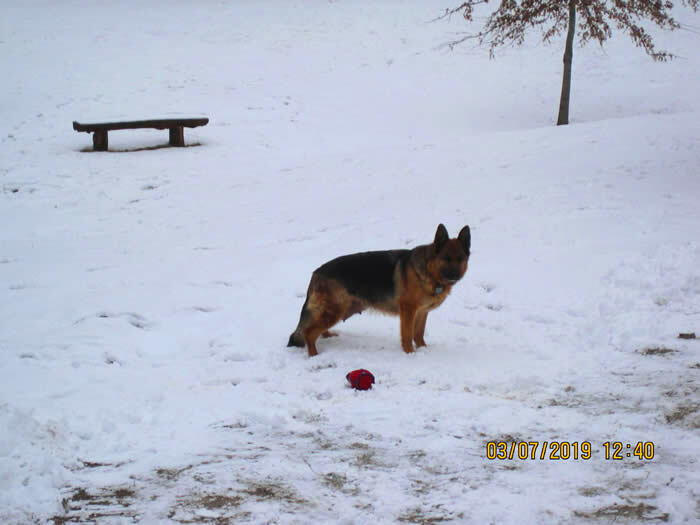 Ava is the grand-daughter of World Sieger in Germany--World Champion VA2 Quenn vom Löher Weg. Ben vom Bonihaus is a direct son of World Champion VA2 Quenn vom Loher Weg. Ben is Ava's dad. Ben is VV2 Cro Sieger. 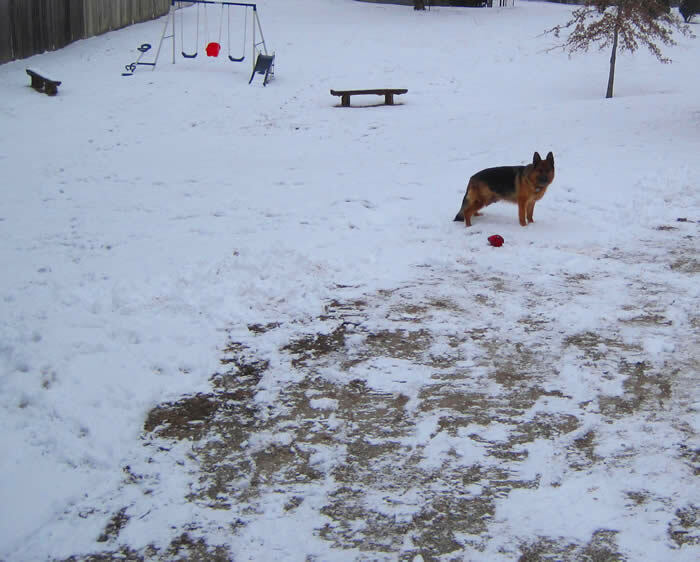 Click on Ava's x Ruger's photo, that will take you to each dog's page. 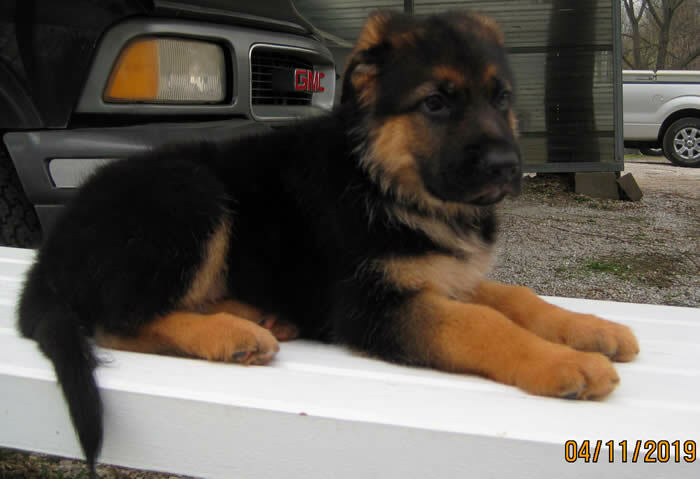 Ava x Ruger produce SUPER nice pups !!! 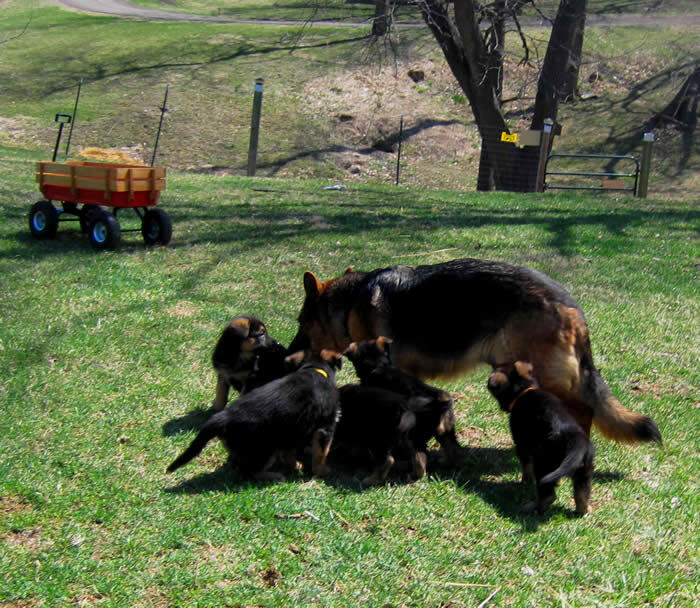 Their previous three litters of pups turned out phenomenal, we expect the same exceptional pups from this upcoming litter. 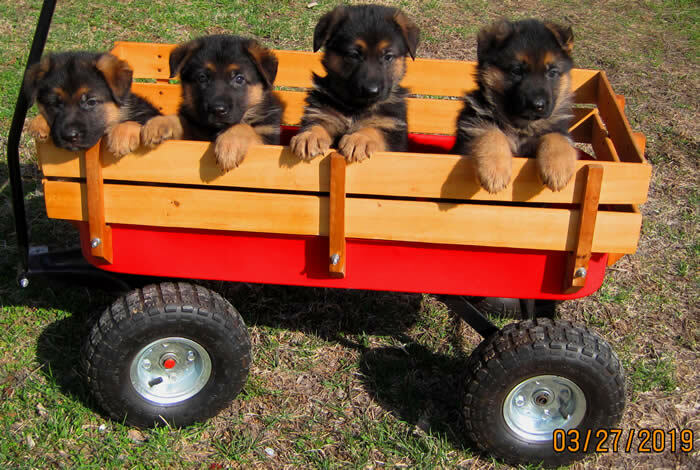 Price of these pups will be $1800 each, plus ALL shipping costs. A $300 non-refundable deposit is required to reserve. 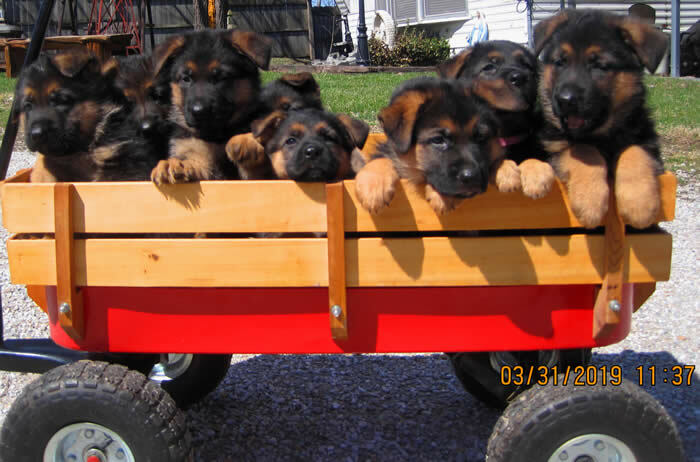 First pick male or first pick female are $2000 each. 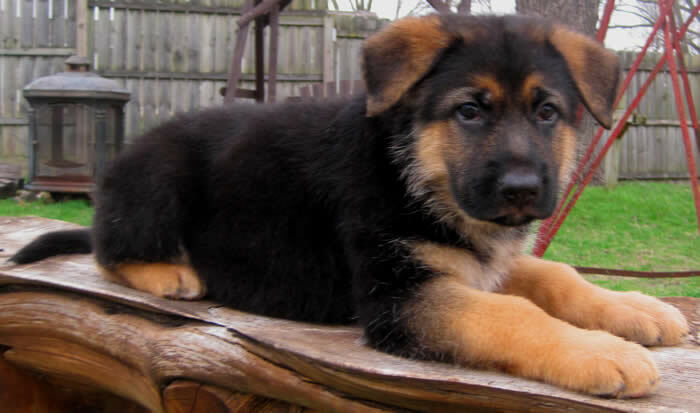 All puppies sold on LIMITED AKC registration as pet/companions. Visit the "contact" link of our website to learn about terms and conditions of deposits prior to submitting a deposit. Be sure you are fully committed prior to submitting a deposit! Price: $2000 for 1st pick male or 1st pick female. $1800 each after the first pick male/first pick female are chosen. Deposit: $300 non-refundable deposit required to reserve. 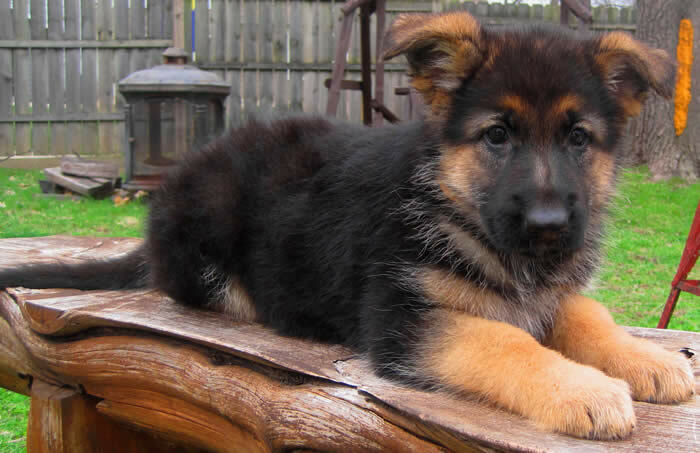 We will NOT reserve ANY puppy without a deposit. 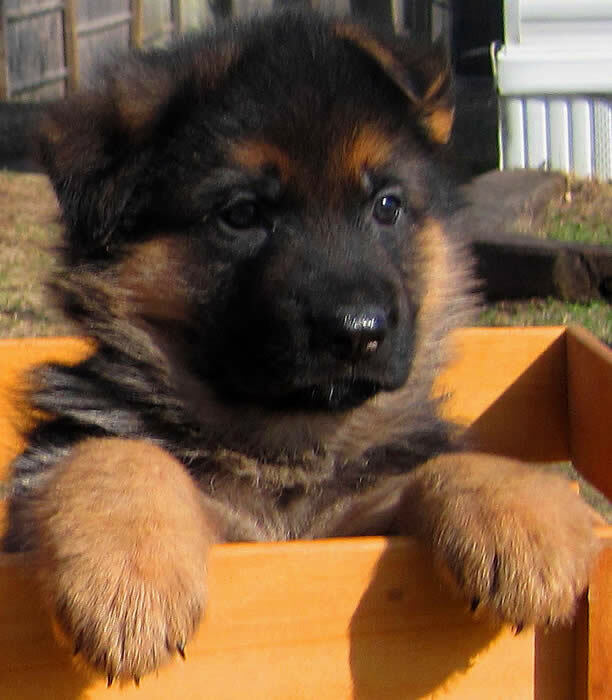 Balance is due in cash at our residence at 8 week old pick up time. Visit the "contact" link of our website for terms and conditions of deposits. change the status from "pending" to reserved. 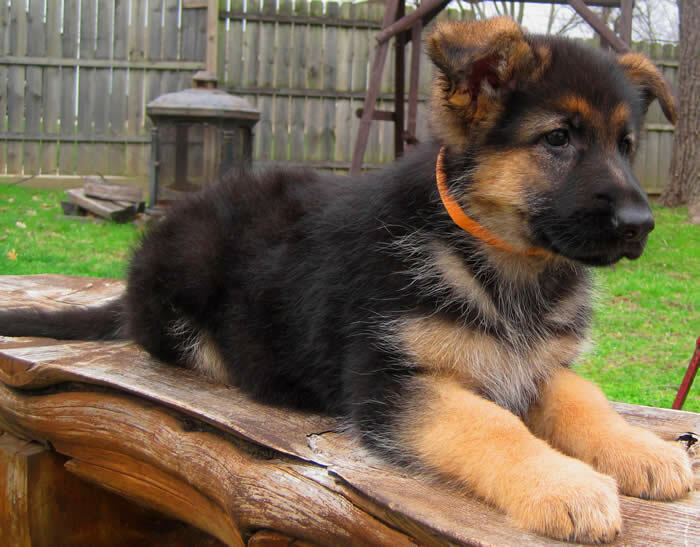 Balance is then due in cash at pick up at our residence at 8 weeks of age. 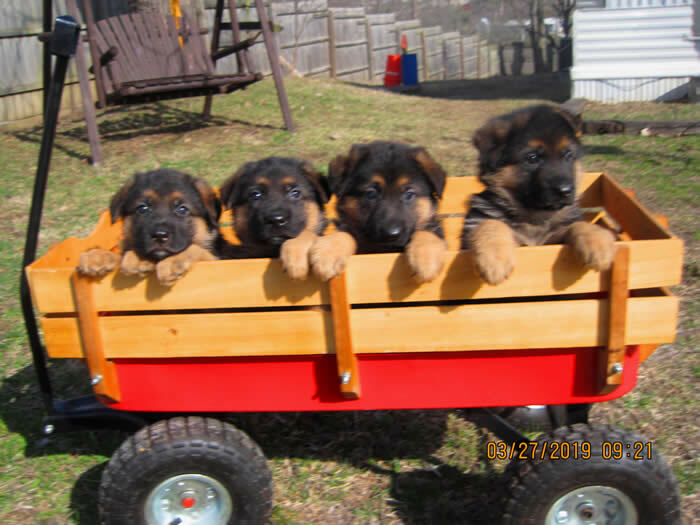 We will only reserve the following puppies until the litter is born, if deposit list is full you can be added to the waiting list. email that deposit was sent. "reserved" means we have received the deposit. 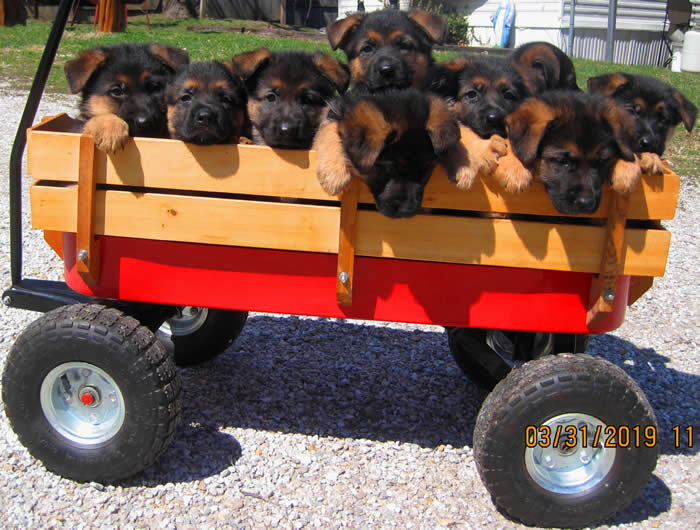 breeding, we honor that by reserving that special puppy just for you. Be sure you are fully committed to a purchase prior to deposit placement. 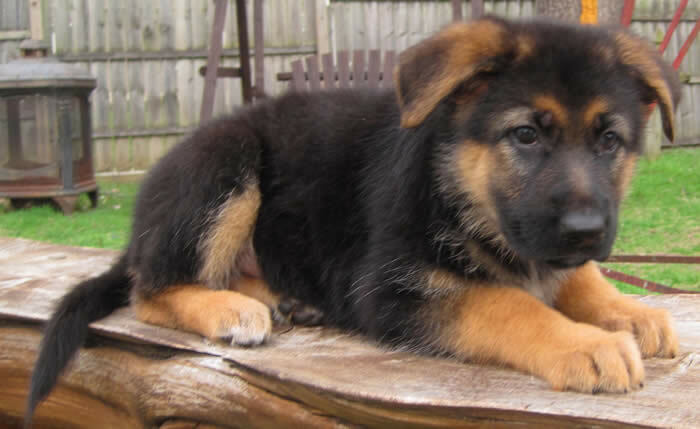 Once deposit is received we tell other prospective buyers that the pup/puppies are sold. 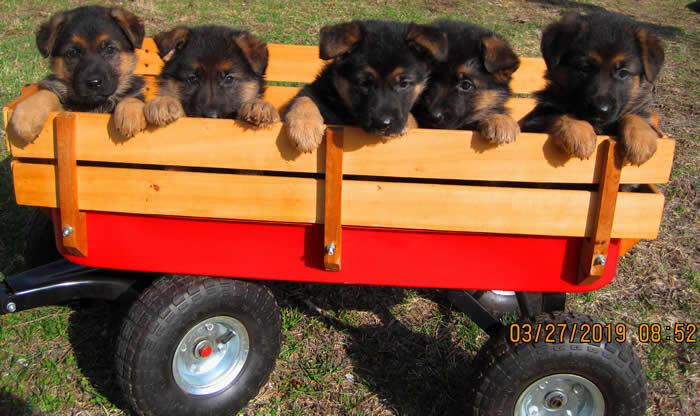 Please reserve early, as our puppies sell quickly. 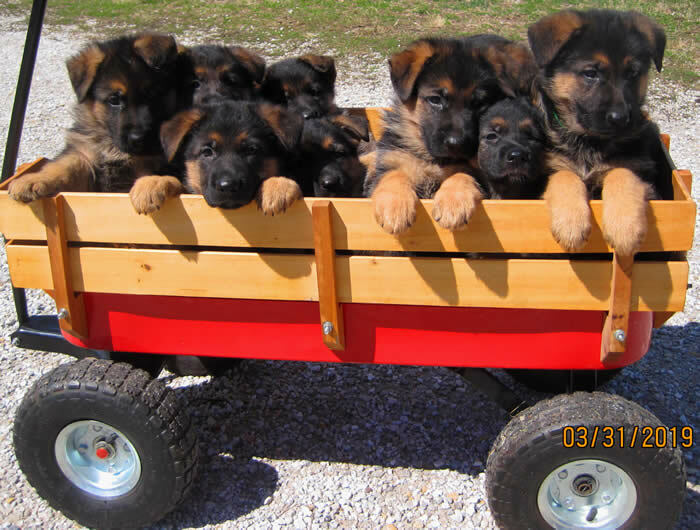 Puppies are reserved in order deposit received. to be here on that day! This is because we have other depositors/customers waiting ahead of you and the next in line after you to make their selection. 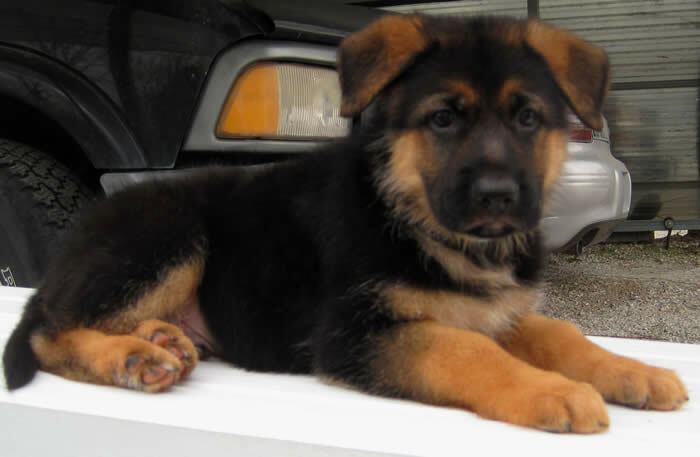 Please be considerate, as our customers travel great distances to pick up their puppy. 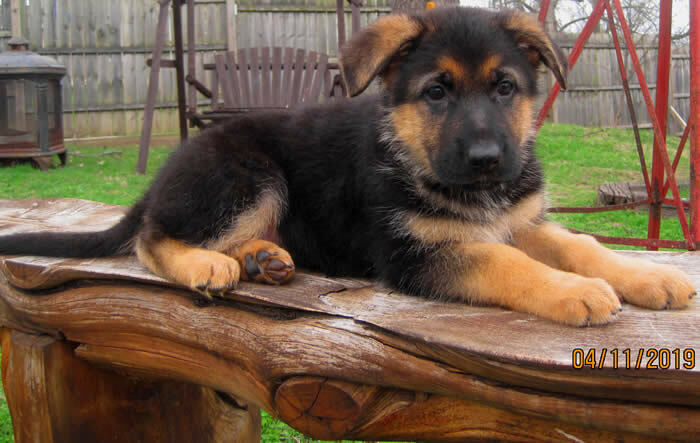 If any of these requirements are not met, deposit will be forfeited and pup sold. 1st pick MALE ($2000) reseved with deposit for David P in California !!! your appointment time is at 8:00 AM on April 12th. They took home red collar male. 2nd pick MALE ($1800) reserved with deposit for Tamara K in Missouri !!! your appointment time is at 8:30 AM on April 12th. Tamara took home brown collar male. 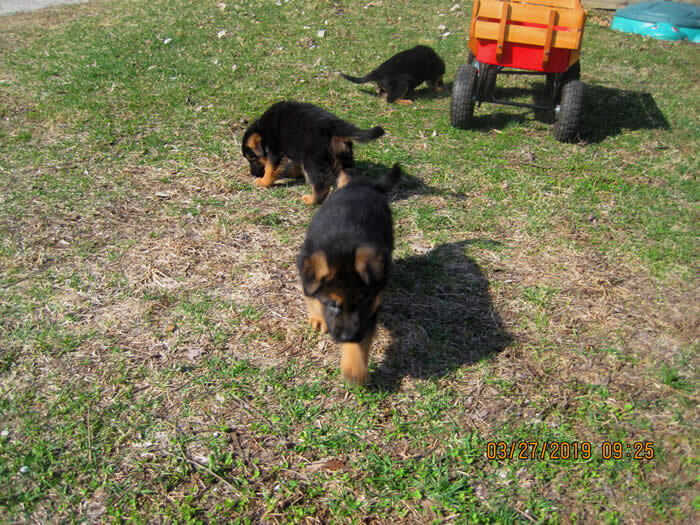 3rd pick MALE ($1800) reserved for Olivia, Brandi, & Allen in La Grange, MO !!! 4th pick MALE ($1800) reserved with deposit for Ruth H in Oregon !!! your appointment time is at 9:30 AM on April 12th. Ruth took home blue collar male. 1st pick FEMALE ($2000) reserved with deposit for James T in Texas !!! your appointment time is at 10:00 AM on April 12th. James took home orange collar female. 2nd pick FEMALE ($1800) reserved with deposit for Joyce & Gary D in WA !!! your appointment time is at 10:30 AM on April 12th. Joyce took home black collar female. your appointment time is at 11:00 AM on April 12th. Denise & Greg took home yellow collar female. 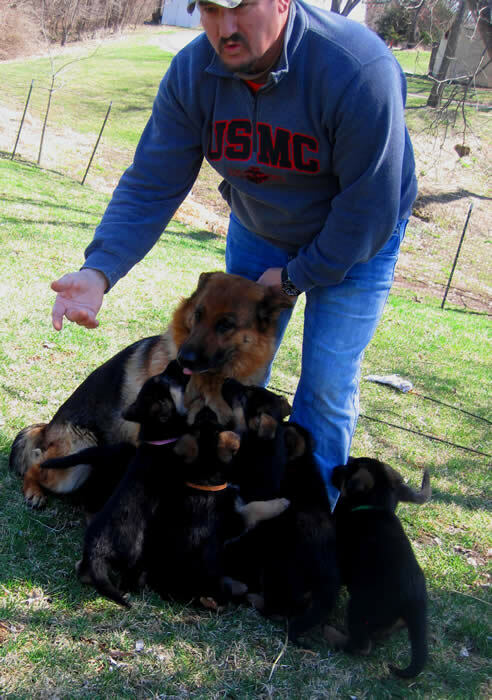 4th pick FEMALE ($1800) reserved for Alex, Marsha, Holden, & son & Oakley in Missouri !!! Alex took home purple collar female. 5th pick FEMALE ($1800) reserved with deposit for Bernie & Susie Liberty, IL they took home pink collar female. 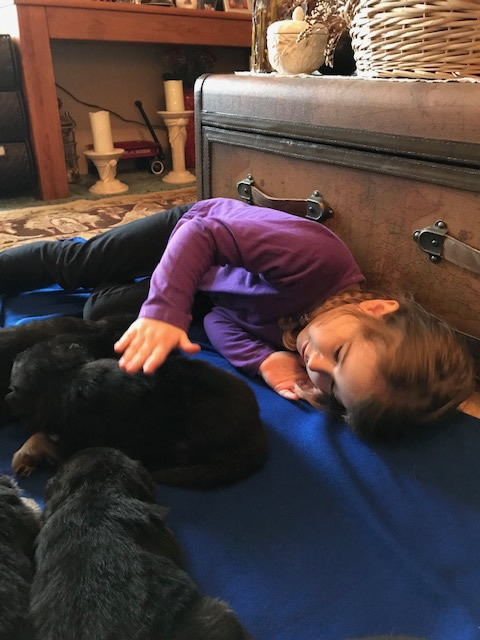 Each puppy is sold with a thorough vet exam and vet health certificate issued in each buyers name at 8 weeks of age prior to leaving. 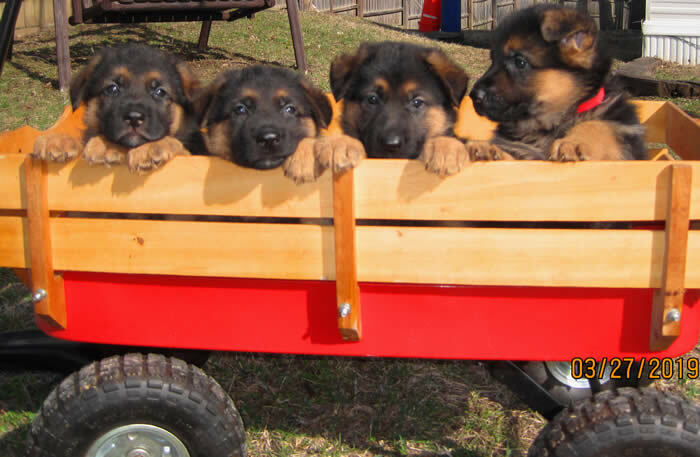 Puppies are wormed at 3, 6, 8 weeks of age using prescription Panacur. 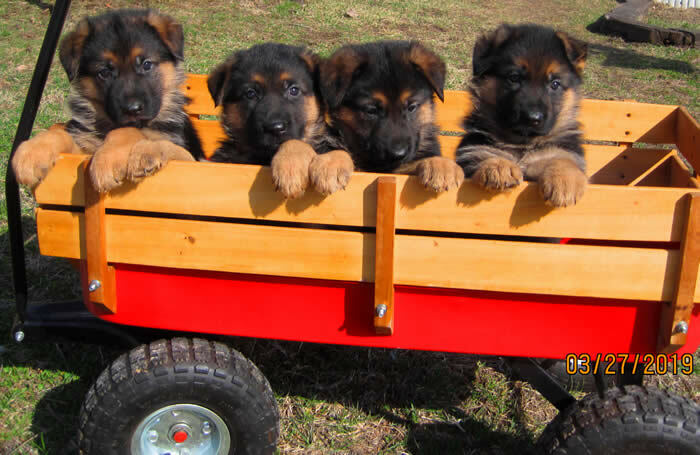 Puppies are vaccinated at 6 & 8 weeks of age. 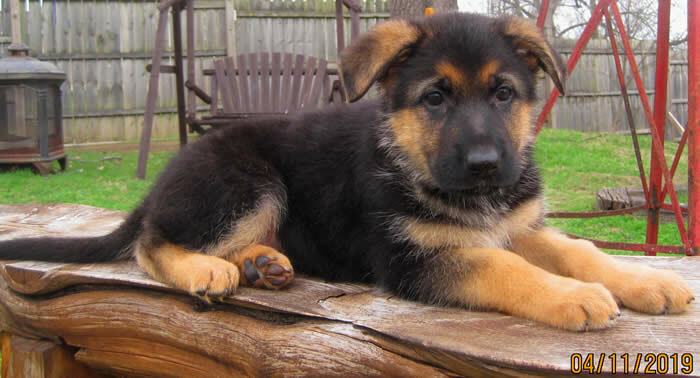 All puppies are micro-chipped. 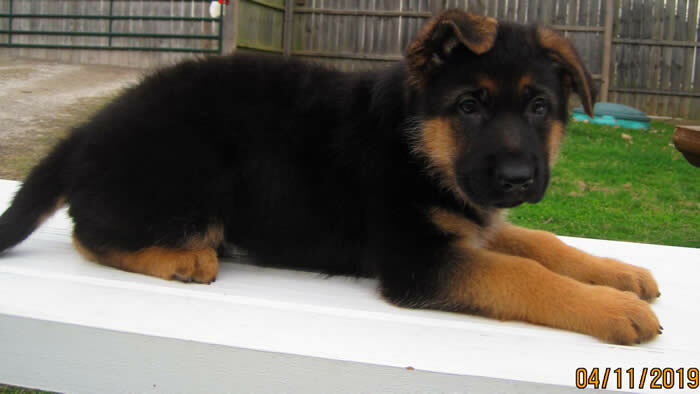 All puppies are sold with AKC limited registration papers and sold as loving pet/companions. Each puppy goes home with their individual folder with all info as described along with copies of parents AKC photos and pedigree. Temperament, health our #1 priority, beauty...is just an added bonus !!! You Won't Find This Quality at These Prices Anywhere Else !!! Germany's Finest Imported World Sought After Bloodlines !!! Expect to pay $3500 and up for the Quality we are selling at only $1800 each! please. Focused and attentive to your needs. 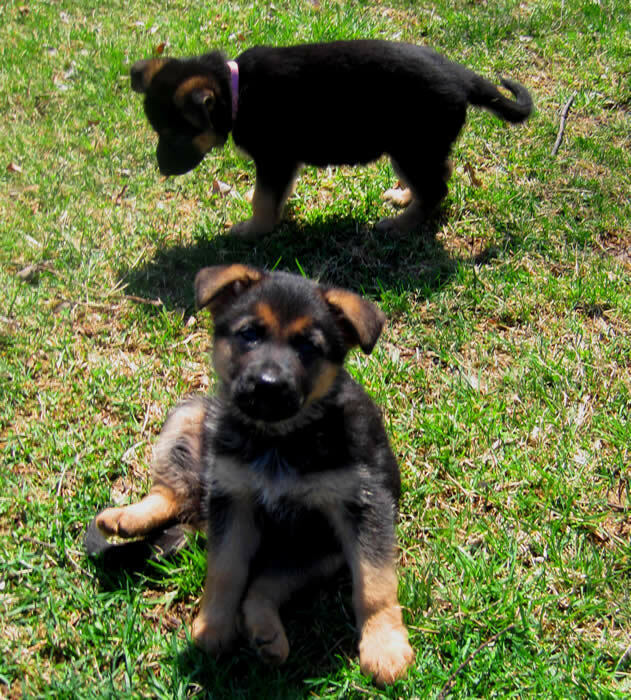 Our pups possess impeccable temperaments with correct social behavior. 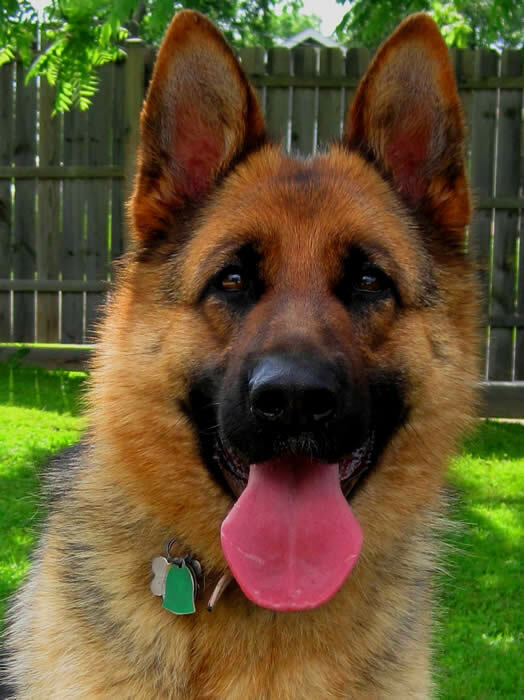 Extremely intelligent, easily trained, a loyal loving family companion for life. certificate in buyer's name. 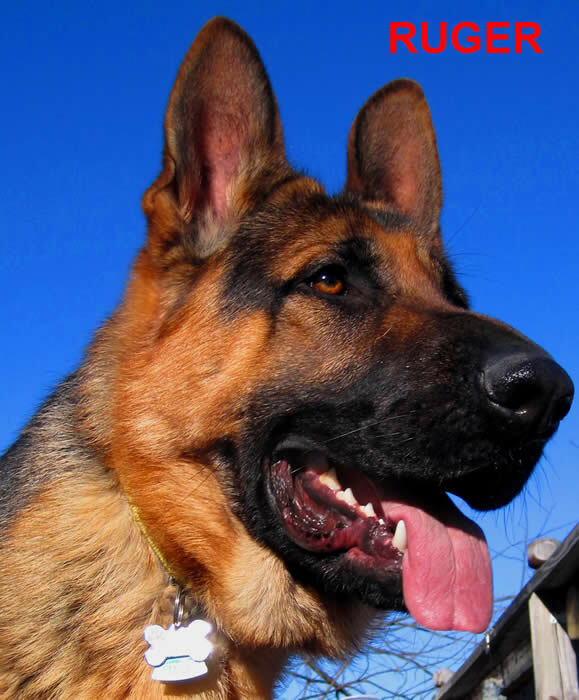 Micro-chipped for permanent identification, current on all vaccinations and de-wormed. 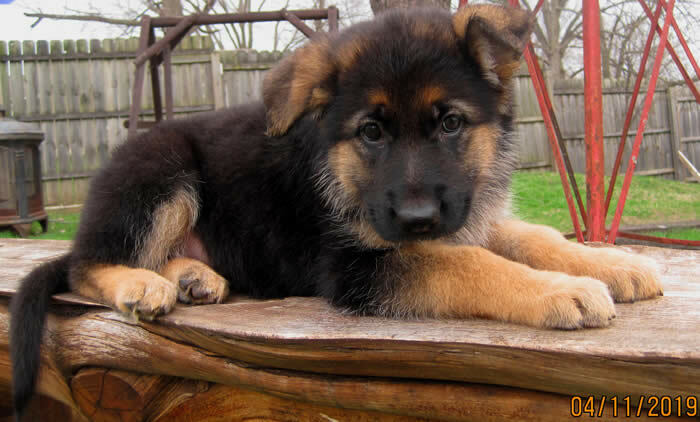 Started in crate training/house-breaking. 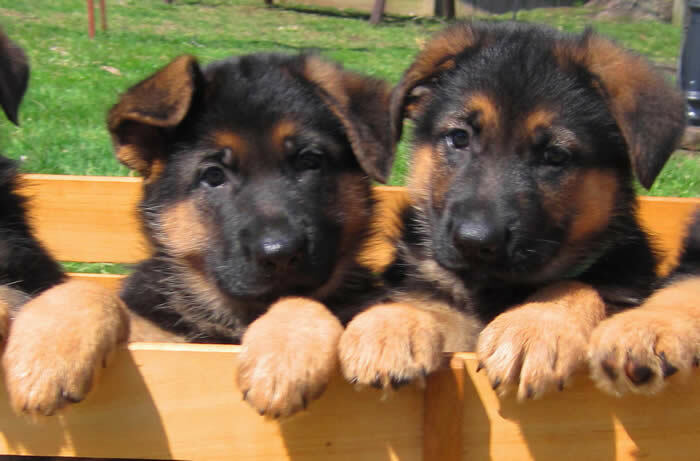 Absolutely gorgeous top notch puppies! We breed for consistency of sound mind and body. 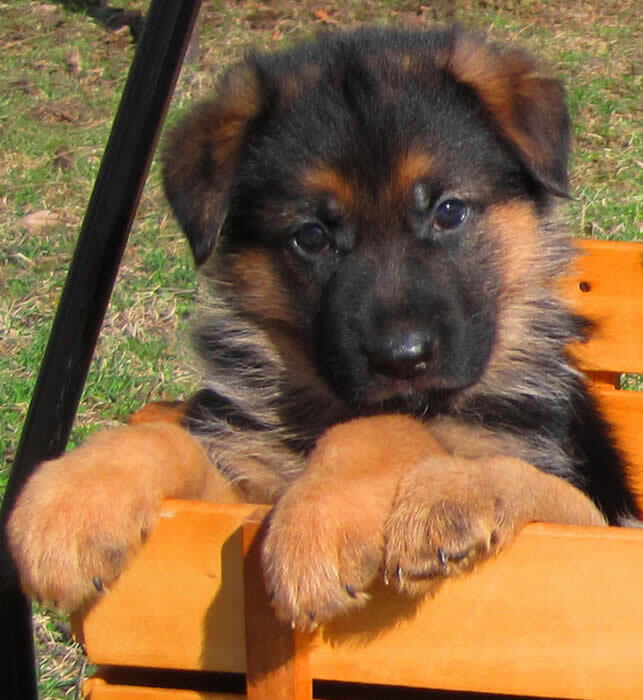 8 weeks of TOTAL care, love, handling, socialization goes into EVERY puppy we sell. This is a FULL time job that we take seriously!!! 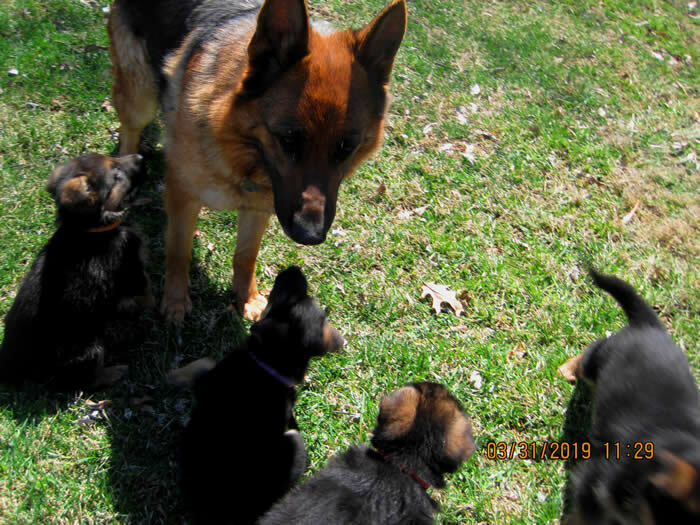 That is why we have people travel across the USA to buy from us, because constant socialization makes a BIG difference, we are proud of every puppy we raise. afford NOT to be protected? Give yourself, and your family a sense of security and peace of mind. Don't live in fear any longer, protect what YOU worked hard for!!! 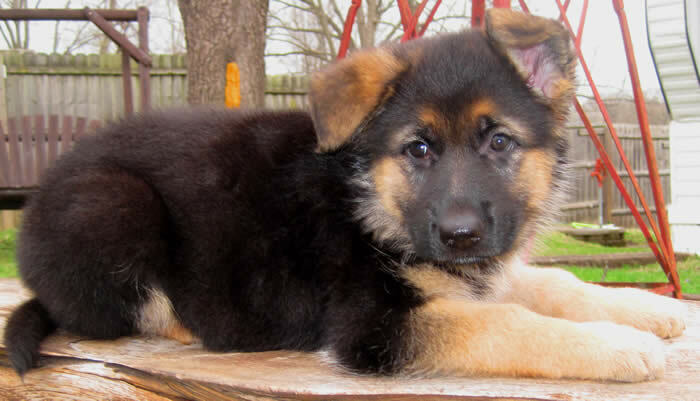 Our pups are extremely intelligent, strong willingness and high trainability. 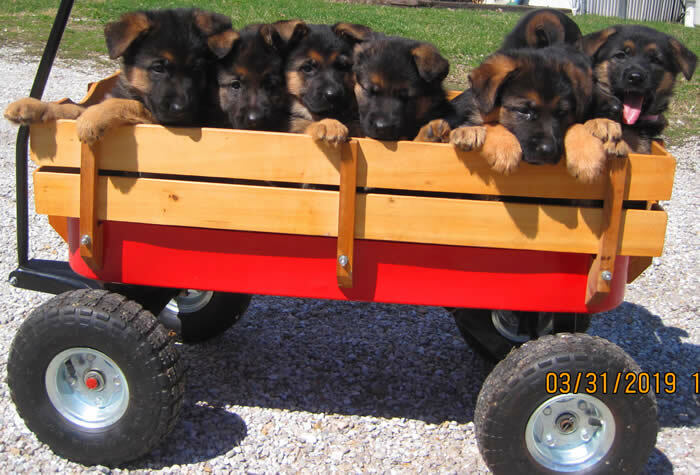 Truly top notch puppies! 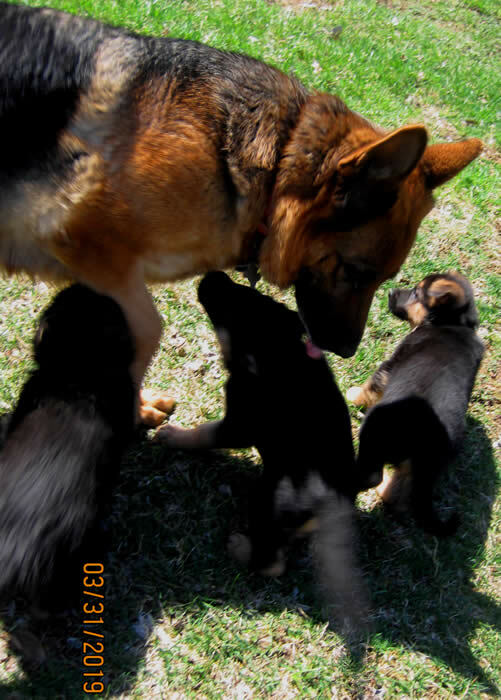 Our pups have strong natural protective instincts, alert, very investigative, confident just like their parents. Excellence in Family Protection. 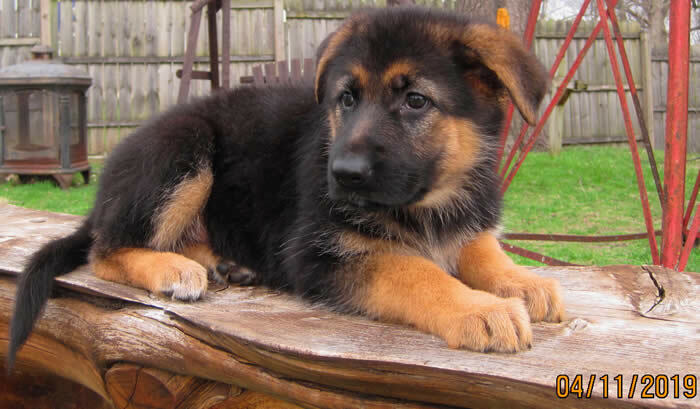 Reserve your puppy today! They won't last long !!! 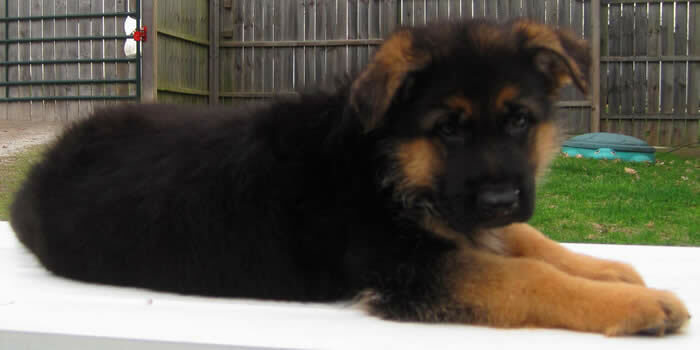 We only offer pups with top personality and temperament; health and strong character included. Our pups are very social and live in close connection to our family! 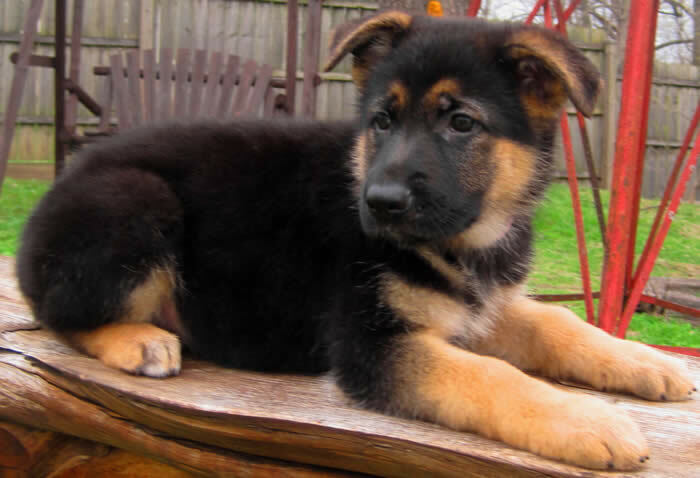 We sell the puppies that EVERYBODY is looking for...the ideal loving loyal family companion, that is also the family protector/guardian without being a liability. Isn't that what everyone desires? I know I do and countless of others do too! 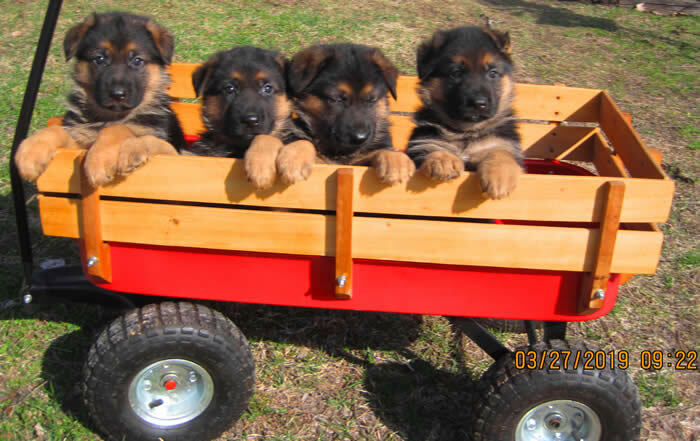 Not to mention, they are drop dead gorgeous Black and Red German Shepherd puppies with big heads, large boned with superb temperaments! Breeding Quality for OVER 36 years, over 30 years in the same location. 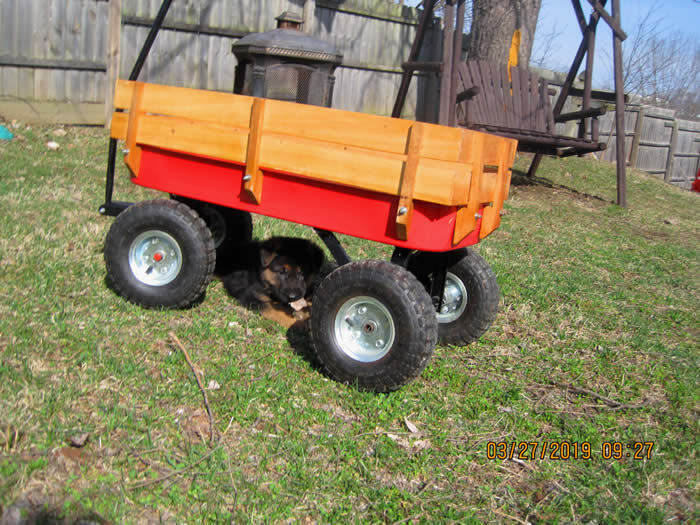 Visit our Gallery link to see references from previous litters of happy customers. 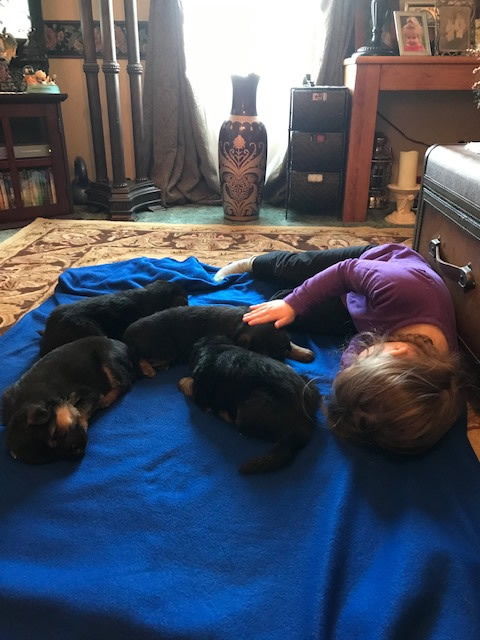 Update 04/11/19: Photos below of 8 week old individual photos of the puppies. We have one MALE for sale. Today they were at the vet, received their vet health certificates. UTD on vaccinations/de-worming. 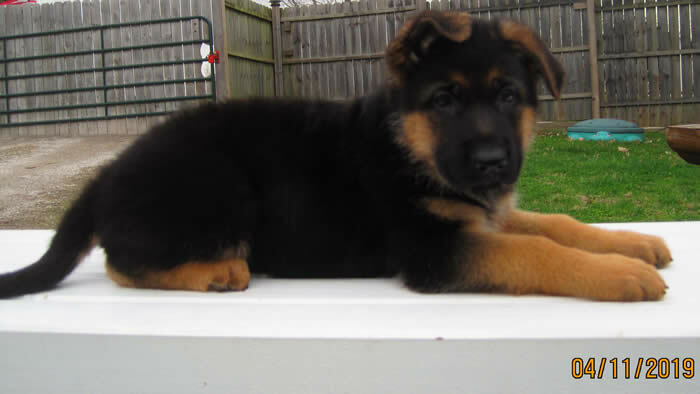 This is the 4th litter from Ava x Ruger of ABSOLUTELY SUPER NICE PUPS!!!!! 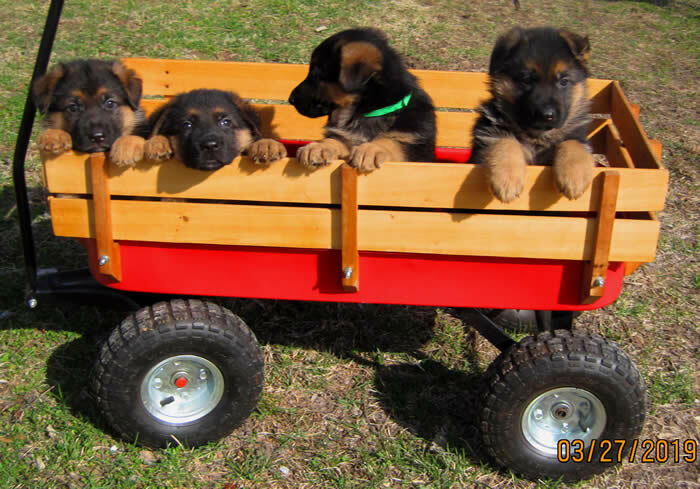 I don't care which pup you choose they are ALL exceptional !!! 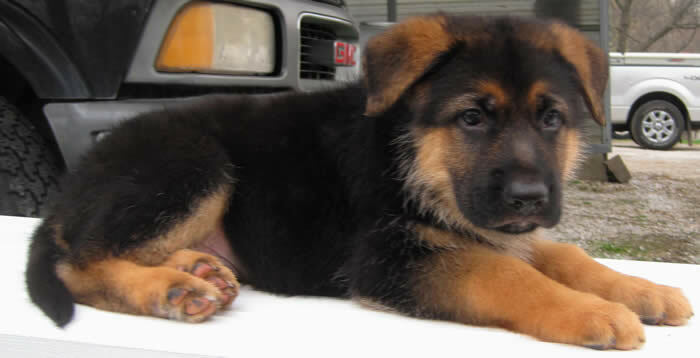 They are alert, confident, loving, sweet, very outgoing and eager to please, playful, loving, Very investigative. 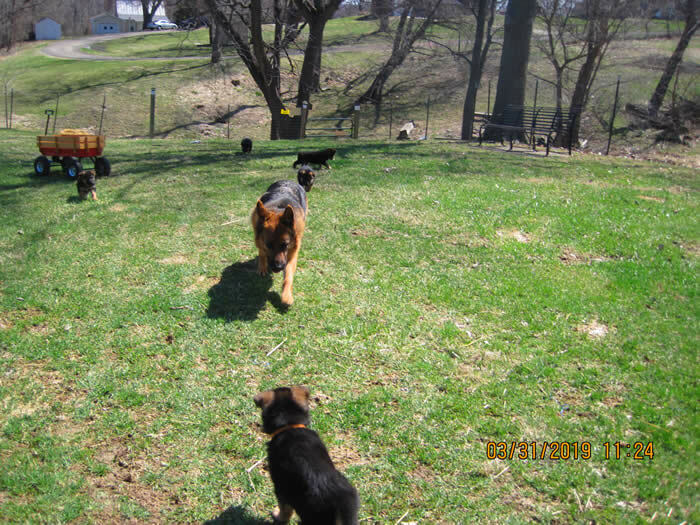 In the pics they are wondering why Carys is barking at them. LOL. 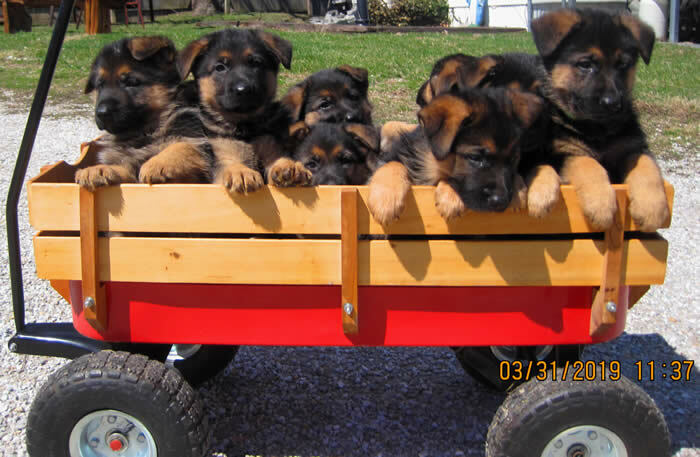 They are all adorable !!!! They are GORGEOUS!!! 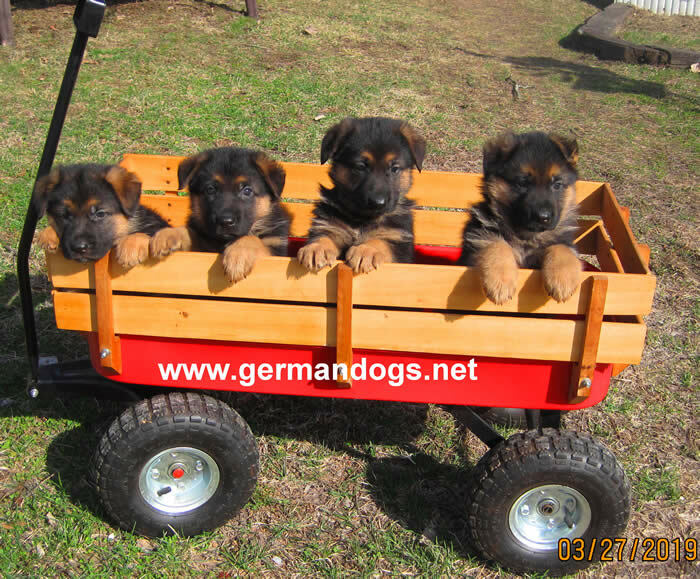 BIG BONED BEAUTIFUL Black and Red German Shepherd Puppies !!! 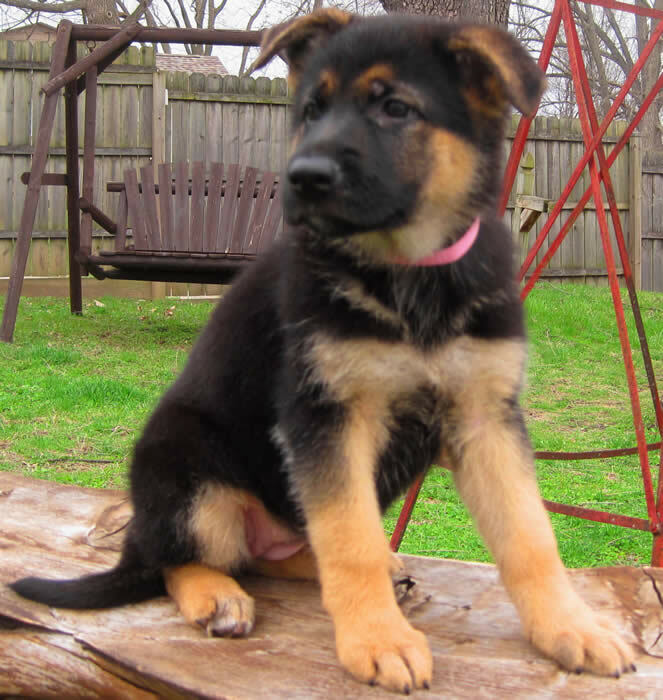 8 week old black collar FEMALE pup. Photo taken 04/11/19. 8 week old orange collar FEMALE pup. Photo taken 04/11/19. 8 week old orange collar FEMALE pup. Sitting proud. 04/11/19. 8 week old orange collar FEMALE pup. 04/11/19. 8 week old PINK collar FEMALE pup. 04/11/19. 8 week old PURPLE collar FEMALE pup. 04/11/19. 8 week old YELLOW collar FEMALE pup. 04/11/19. 8 week old YELLOW collar FEMALE pup. 04/11/19. She's too big for the bench. LOL. 8 week old BLUE collar MALE pup. 04/11/19. 8 week old BROWN collar MALE pup. 04/11/19. 8 week old GREEN collar MALE pup. 04/11/19. 8 week old RED collar MALE pup. 04/11/19. 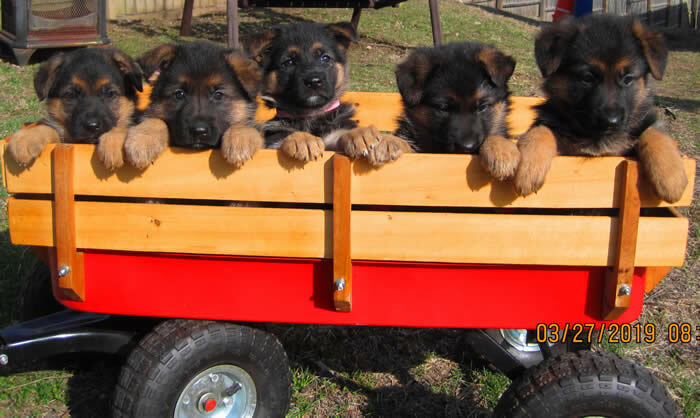 7 week old FEMALE pups. 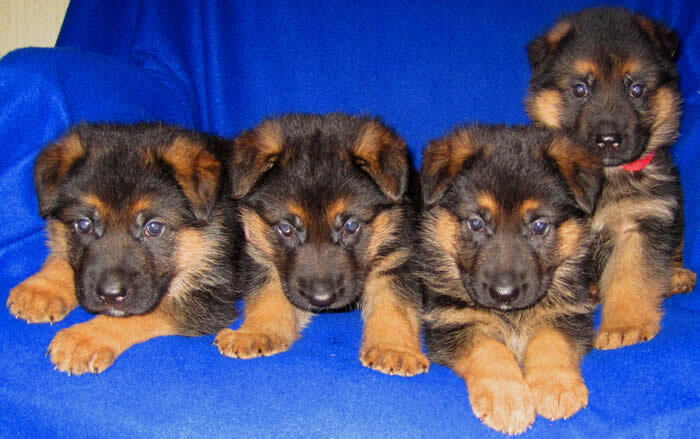 L to R..black, orange, pink, purple and yellow collar female pups. Photo taken 04/06/19. They are drop dead GORGEOUS !!!!! 7 week old MALE pups. 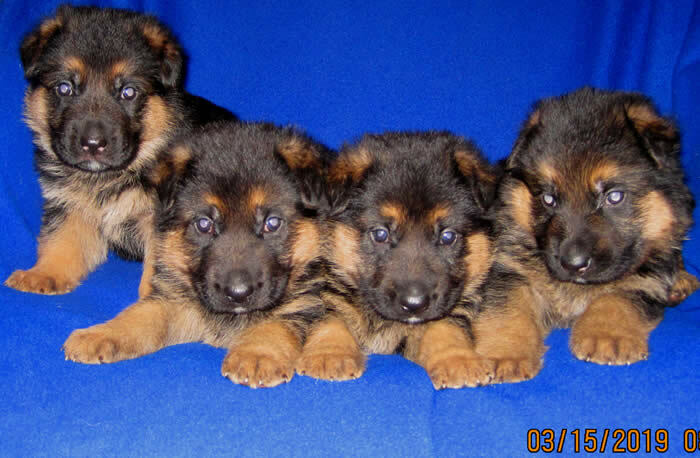 L to R..blue, brown, green and red collar male pups. Photo taken 04/06/19. 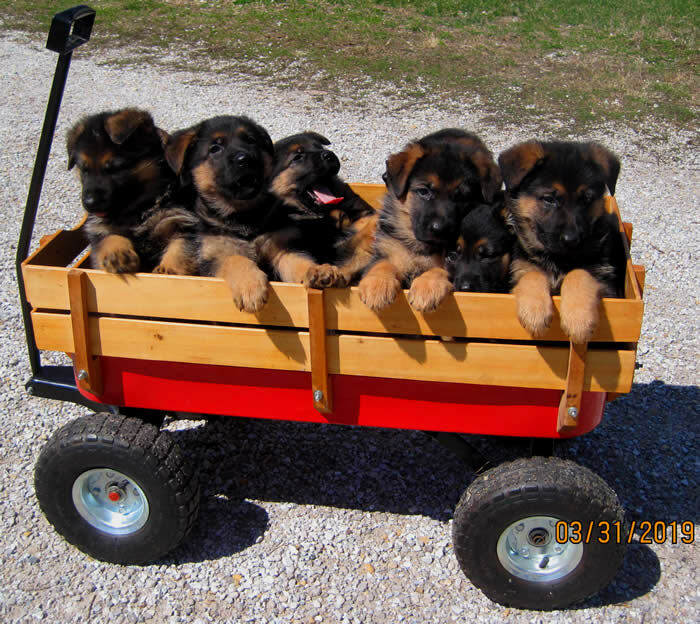 They are HUGE, SOLID BIG GORGEOUS Puppies !!!!!! 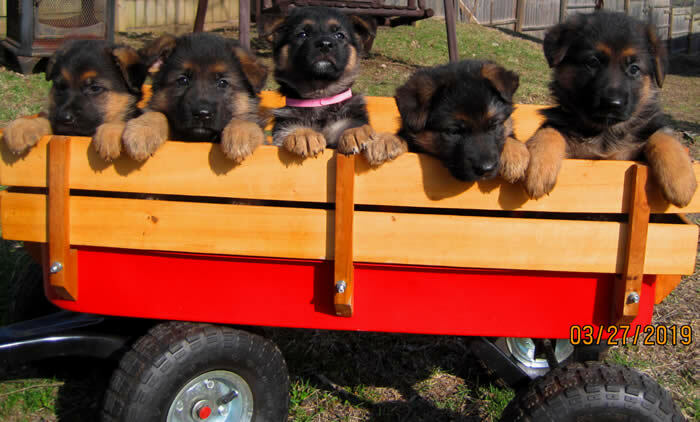 7 week old FEMALE pups. 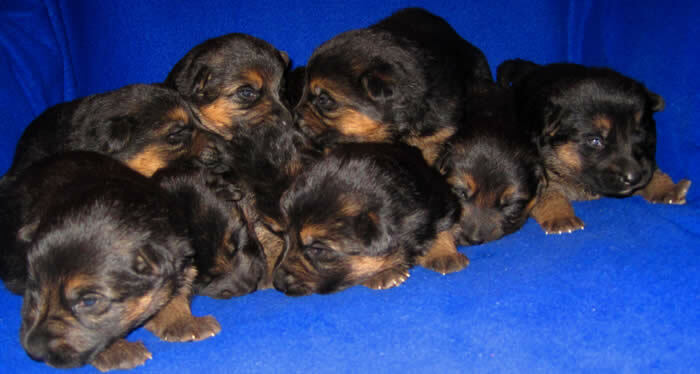 L to R..black, orange, pink, purple, & yellow collar female pups. Photo taken 04/06/19. 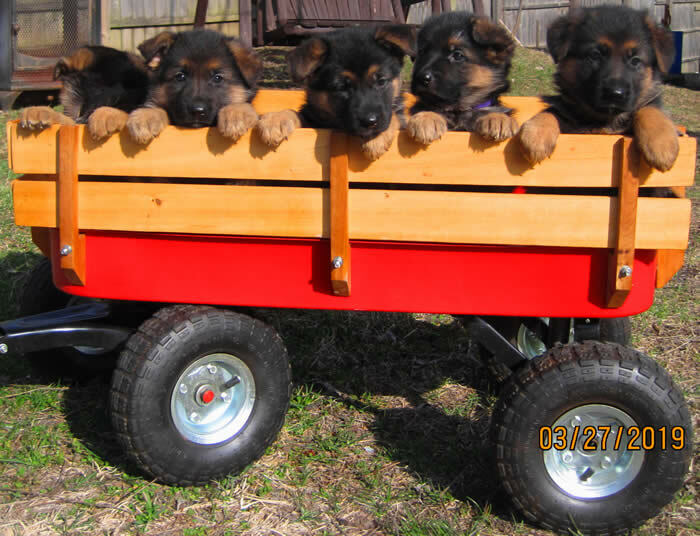 7 week old MALE pups. 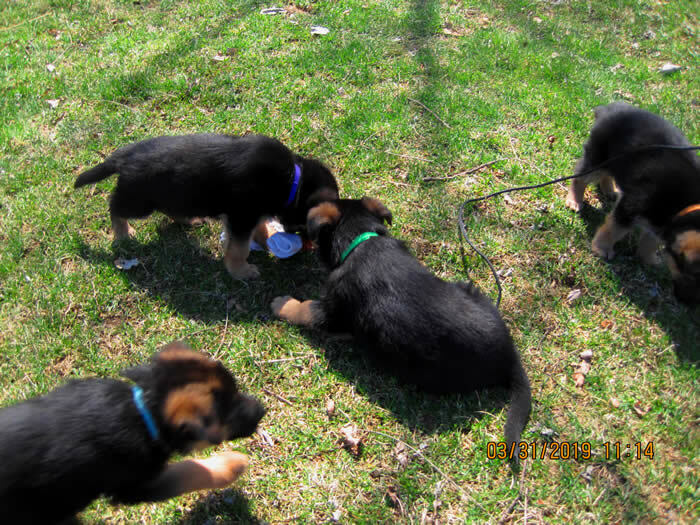 L to R..blue, brown, green and red collar male pups. 7 week old MALE pups. 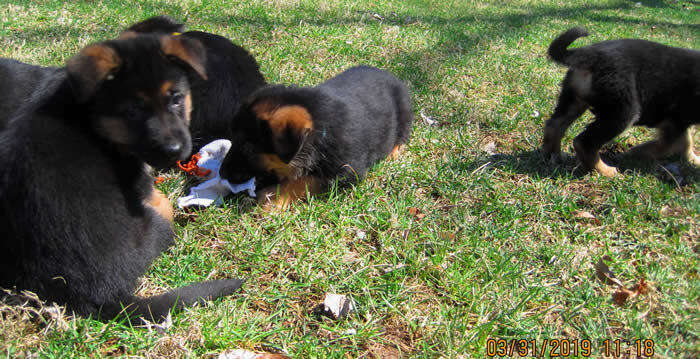 L to R..blue and brown collar MALE pups. 4/06/19. 7 week old MALE pups. 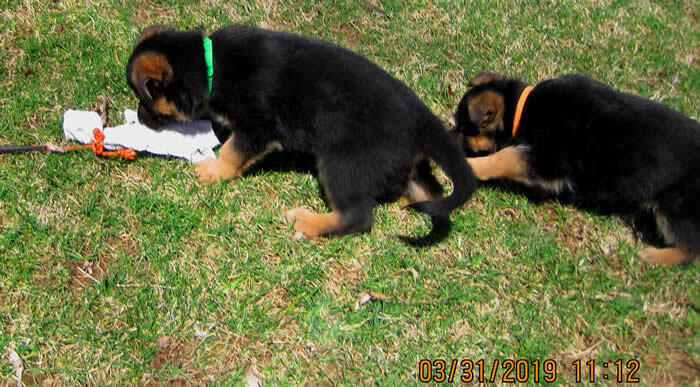 L to R..Green and red collar male pups. 7 week old MALE pups. 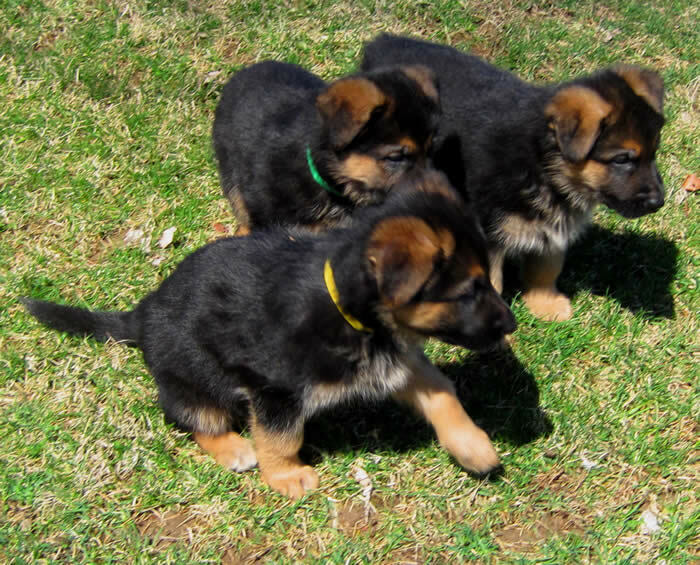 L to R..Brown and Green collar MALE pups. 4/06/19. 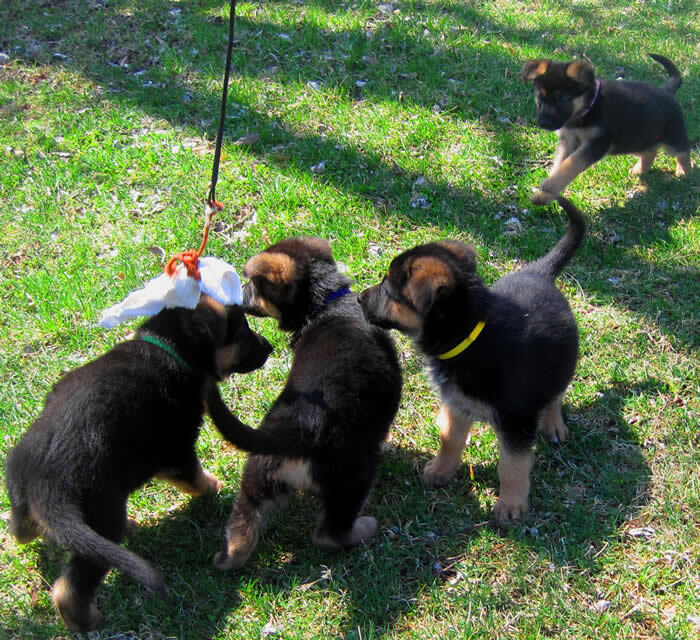 6 week old puppies playing and having a great time today. Pic taken 3/31/19. 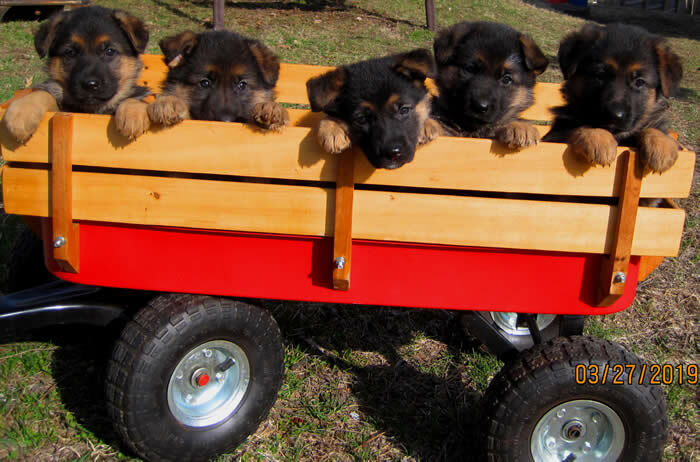 6 week old puppies ready to play. Pic taken 03/31/19. Mama Ava and her babies. Mother and child reunion LOL. 3/31/19. 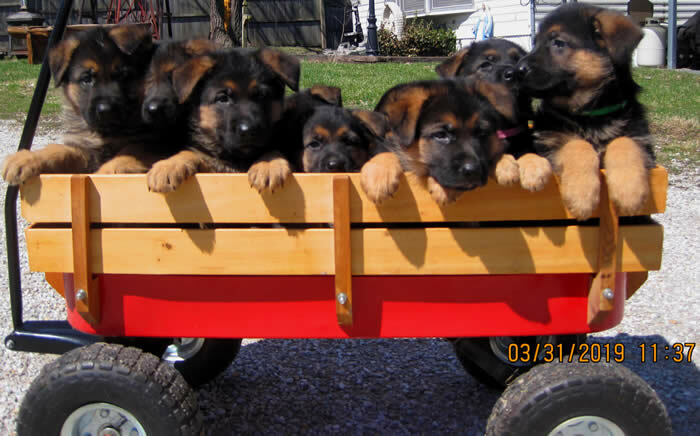 All 9 puppies, 5 girls and 4 boys. 6 weeks old. Pic taken 03/31/19. 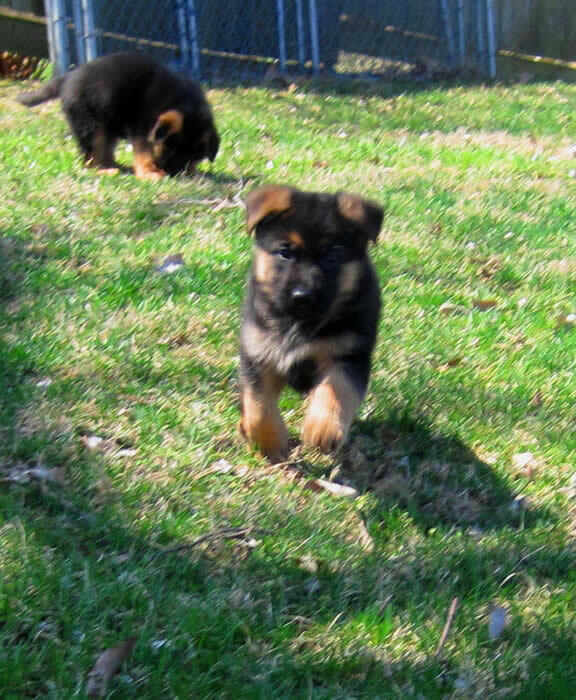 6 week old black collar female puppy running. 3/31/19. 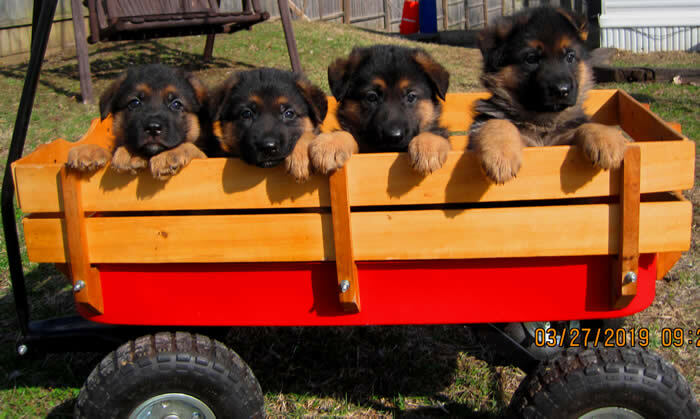 6 week old puppies. 3/31/19. 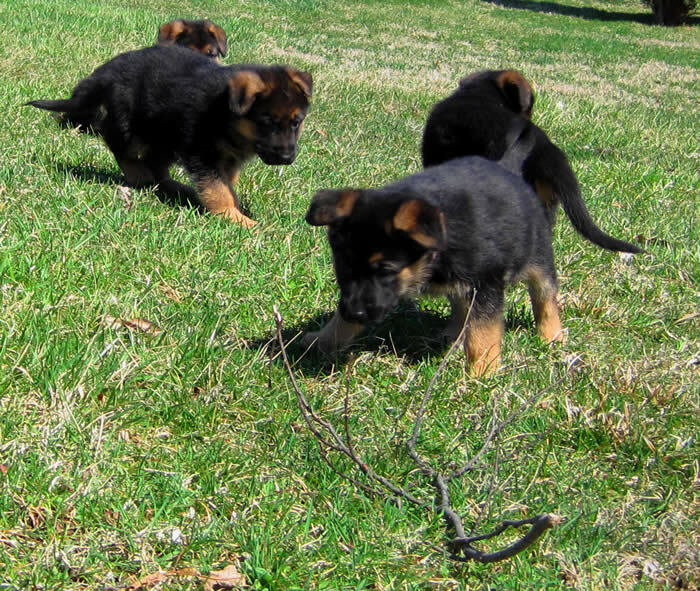 6 week old puppies playing with the tug/whip has a rag on the end. They LOVE it. 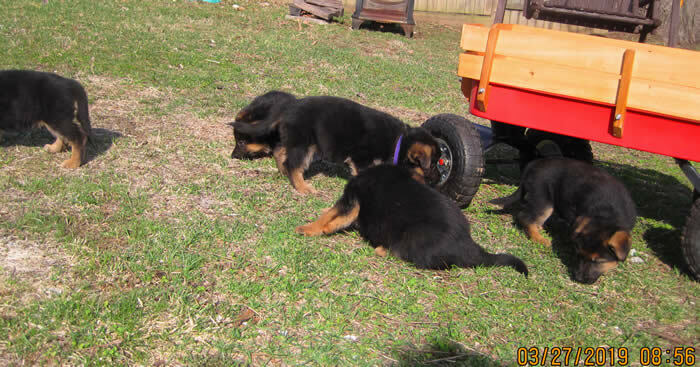 blue collar male (left) purple collar female and green collar male, and orange collar female on right. purple collar female and green collar male playing with tug rope. green collar male caught it :) Orange collar female on the right. 6 week old FEMALE pups. 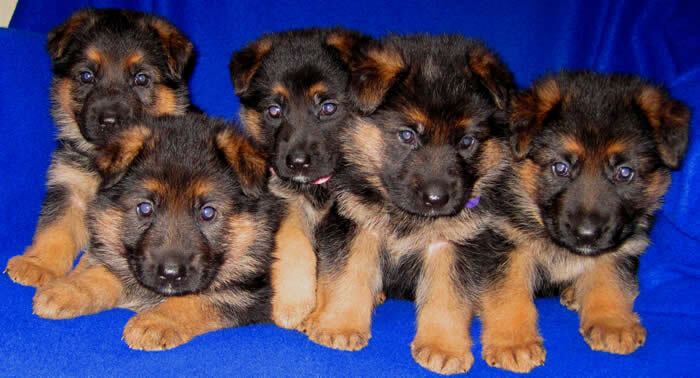 L to R..black, orange, pink, purple, and yellow collar female pups. 3/27/19. 6 week old MALE pups. 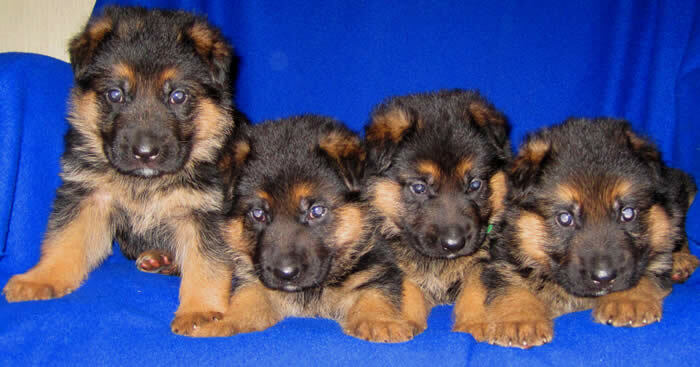 L to R..blue, brown, green and red collar MALE pups. 6 week old FEMALE pups. 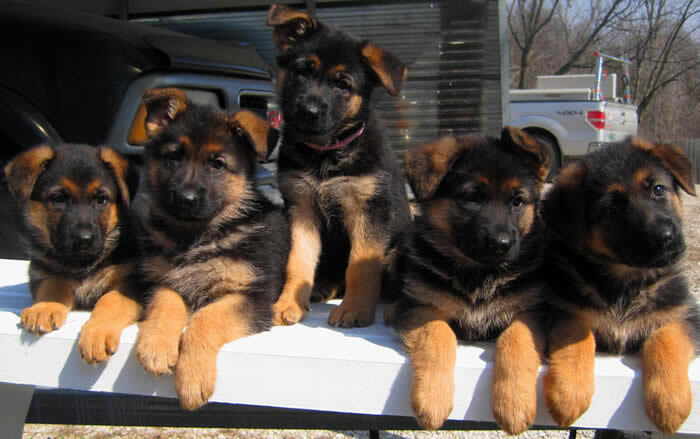 L to R..black, orange, pink, purple and yellow collar female pups. 6 week old FEMALE pups. 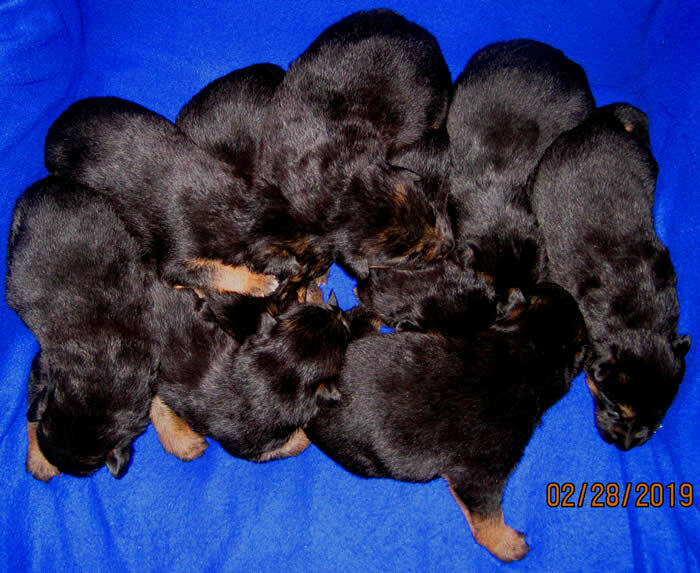 L to R..black, orange, pink, purple, & yellow collar female pups. 6 week old FEMALE pups. L to R..black, orange, pink, purple, yellow collar girls. 6 week old FEMALE pups. L to R..black, orange, pink, purple & yellow collar girls. 6 week old MALE pups. They had ENOUGH of the pics LOL. 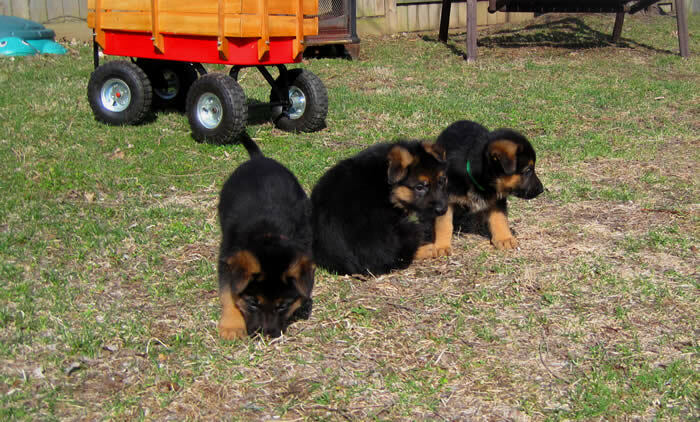 L to R..black, brown, green and red collar male pups. 6 week old FEMALE pups. 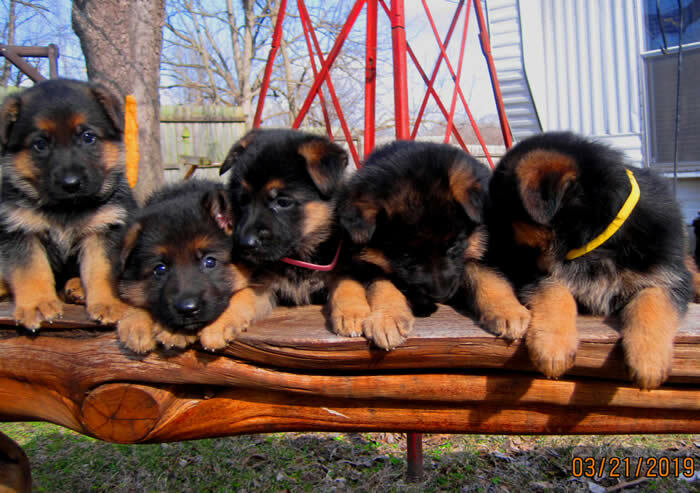 L to R..black, orange, pink, purple, & yellow collar girls. 6 week old MALE pups. 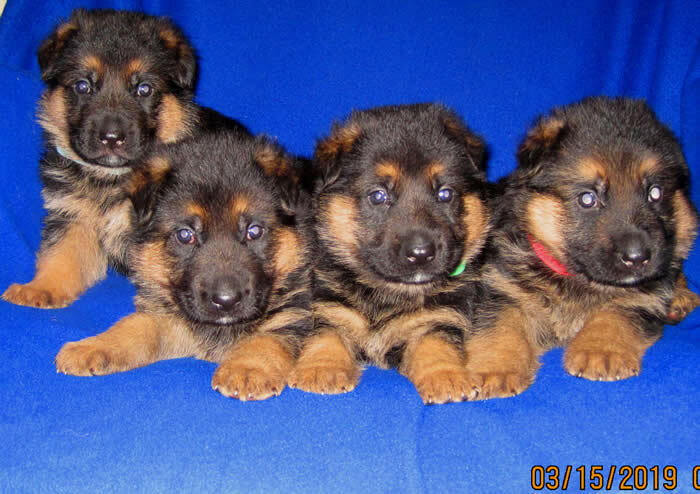 L to R..blue, brown, green & red collar MALE pups. 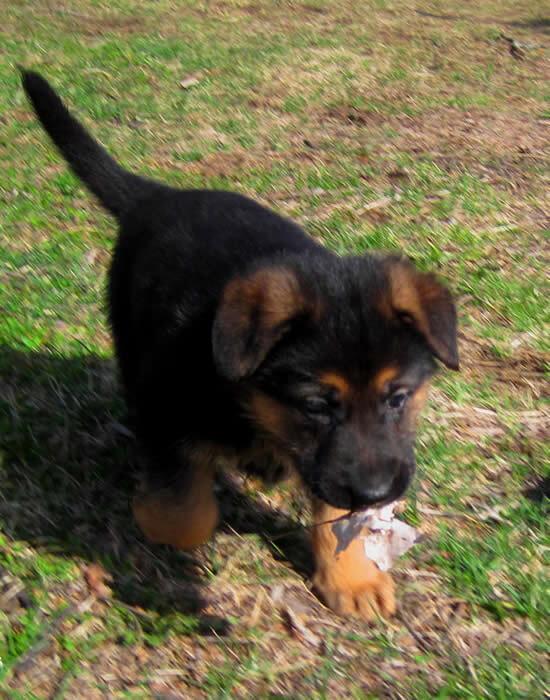 6 week old pups at play. 6 week old female pups. 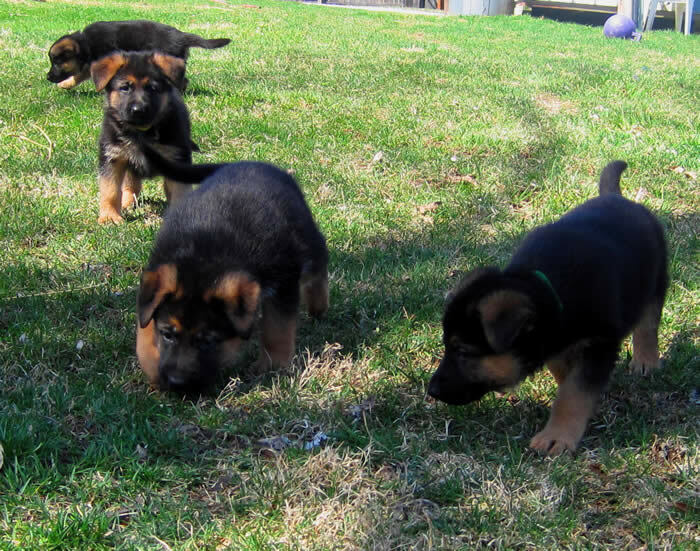 6 week old female pups at play. 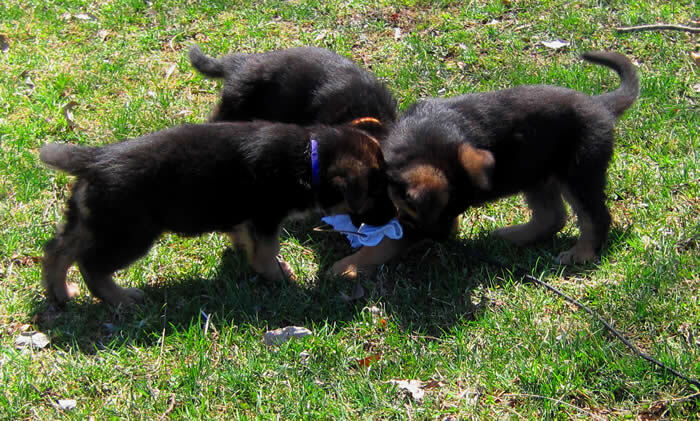 6 weekold MALE pups at play. 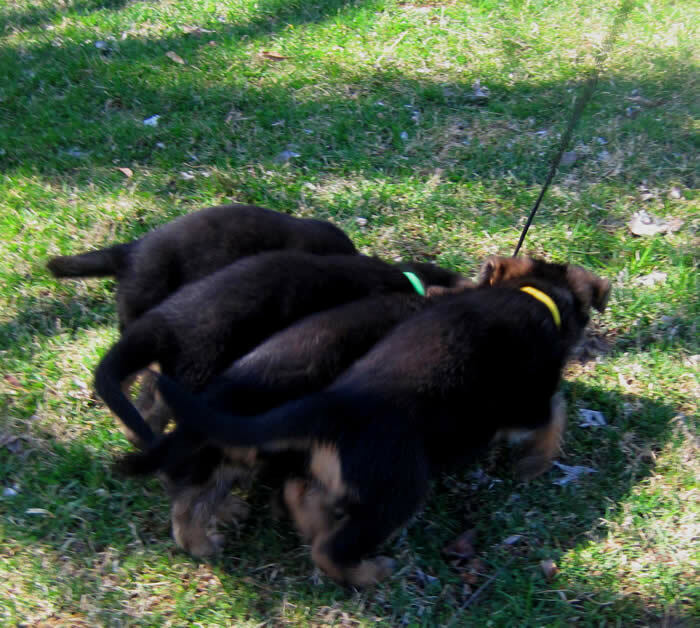 6 week old MALES at play. 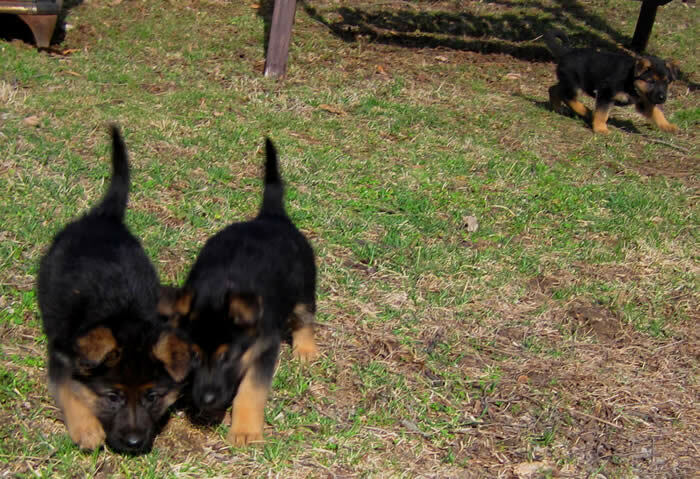 6 week old MALE pups at play. 6 week old red collar MALE puppy. 5 week old FEMALE pups. 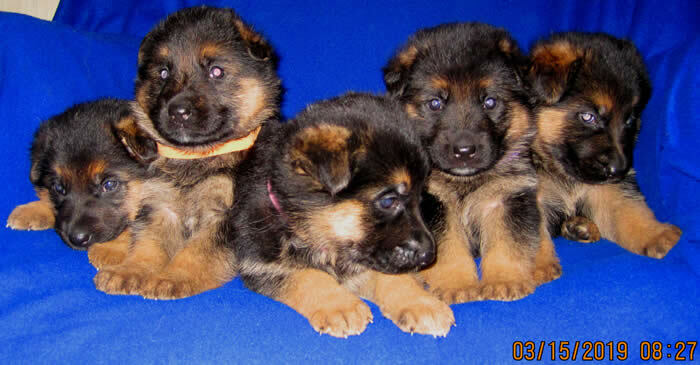 From left to right..black, orange and pink collar female pups. Photo taken 3/21/19. 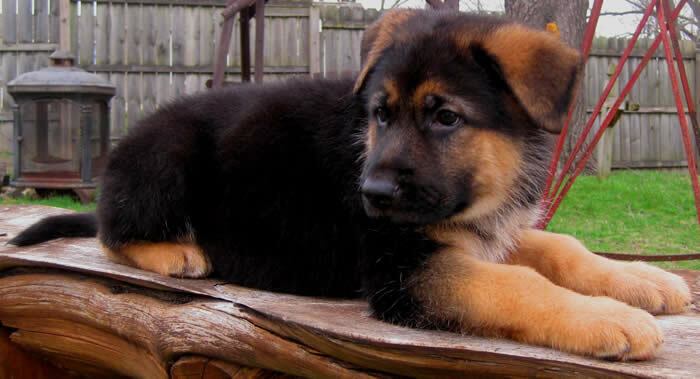 BIG GORGEOUS Black and Red German Shepherd puppies. Beautiful blocky heads. 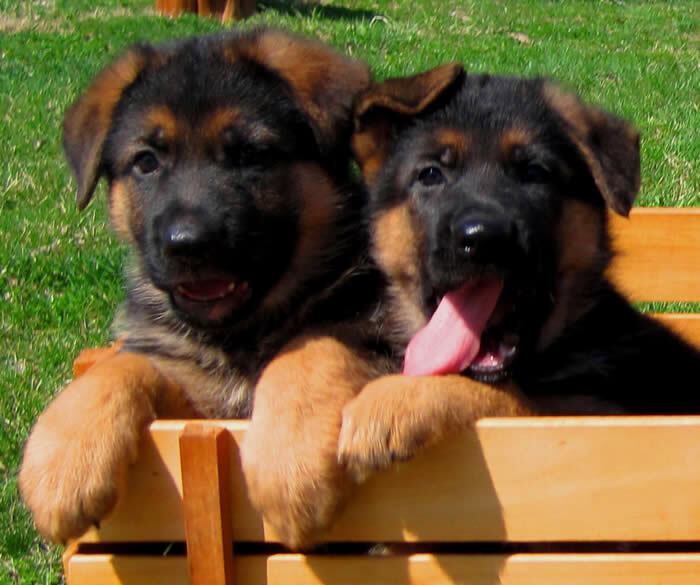 Expressive, confident, super nice pups !!! 5 week old FEMALE pups. 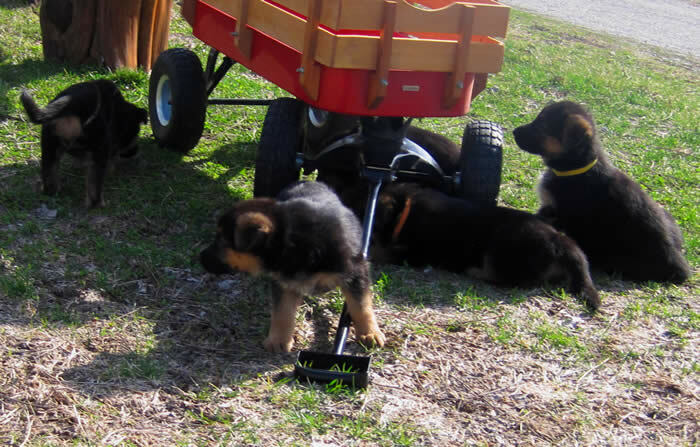 Left to right..black, orange, pink, purple, yellow collar female pups. Pic taken 3/21/19. 5 week old MALE pups. 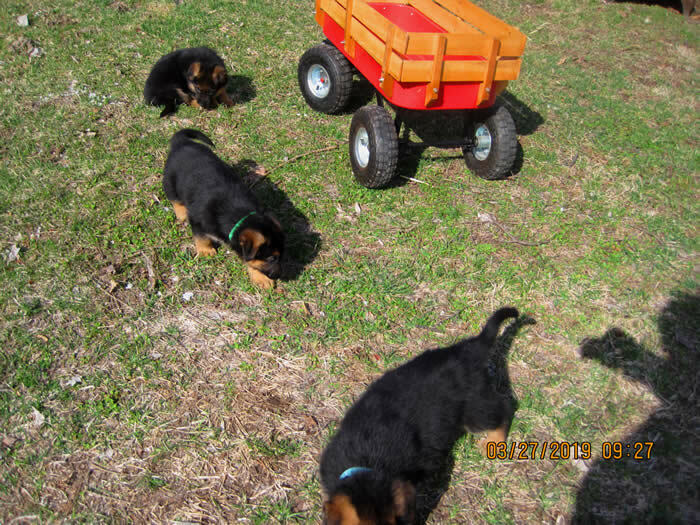 Left to right..blue, brown, green and red collar male pups. 5 week old FEMALE pups. 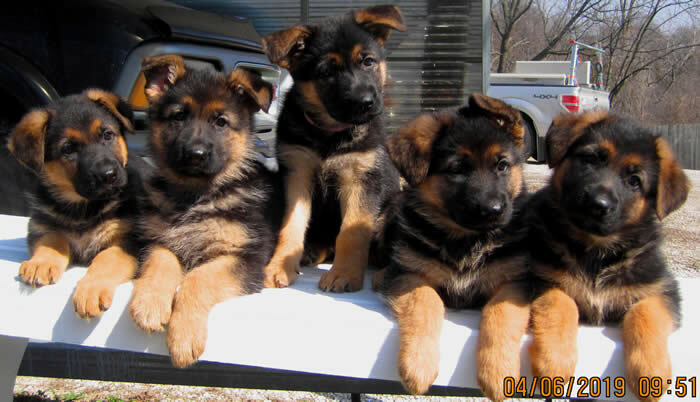 L to R..black, orange, pink purple, yellow collar female pups. 5 week old MALE pups. 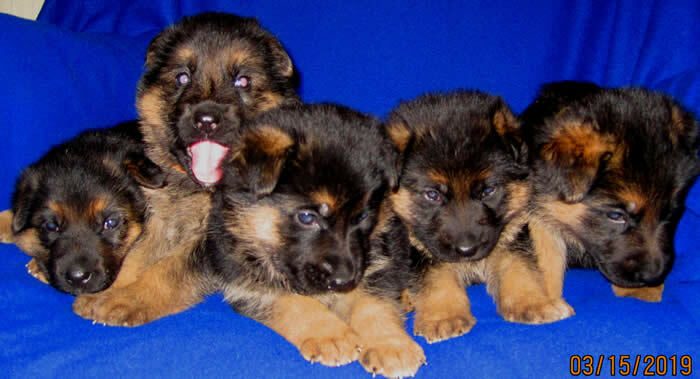 L to R..blue, brown, green and red collar male pups. 5 week old FEMALE pups. 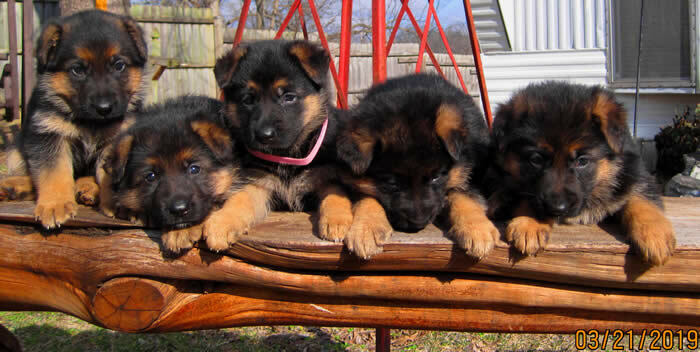 L to R..black, orange, pink, purple, and yellow collar female pups. 5 week old FEMALE pups. 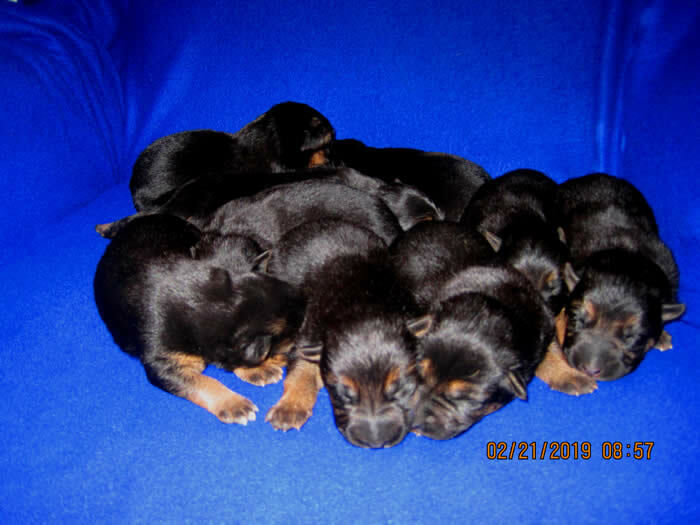 L to R..black, orange, pink, purple, & yellow collar female pups. 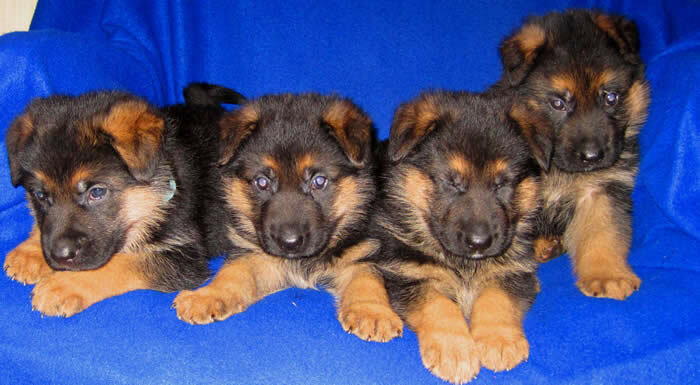 4 week old MALE pups from left to right..blue, brown, green and red collar male pups. 3/15/19. 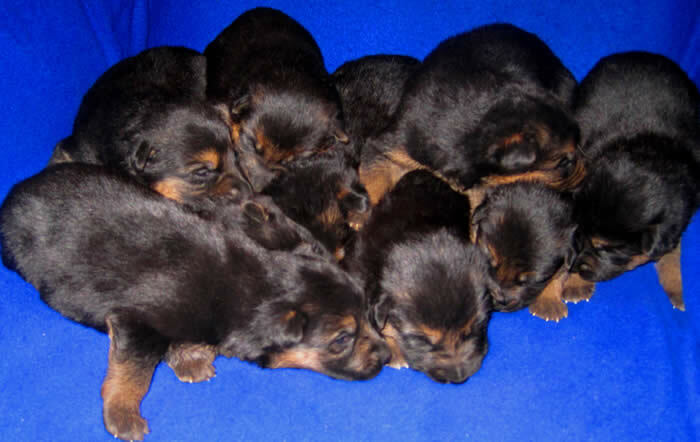 4 week old FEMALE pups from left to right..black, orange, pink, purple, yellow collar female pups. 3/15/19. 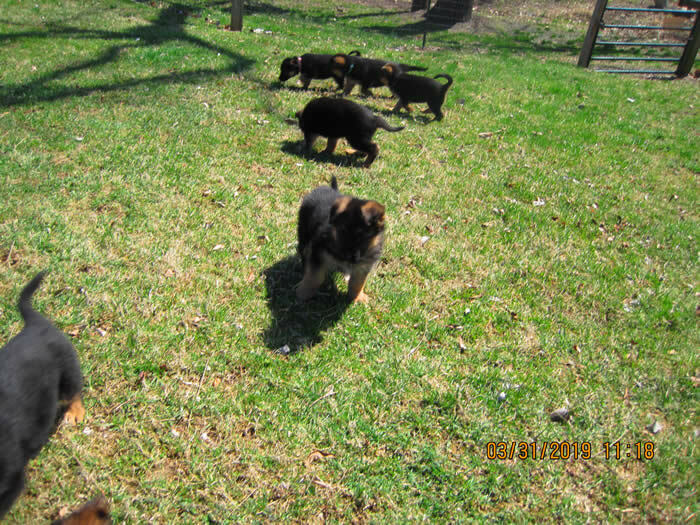 4 week old FEMALE pups from left to right..black, orange, pink, purple and yellow collar female pups. 3/15/19. 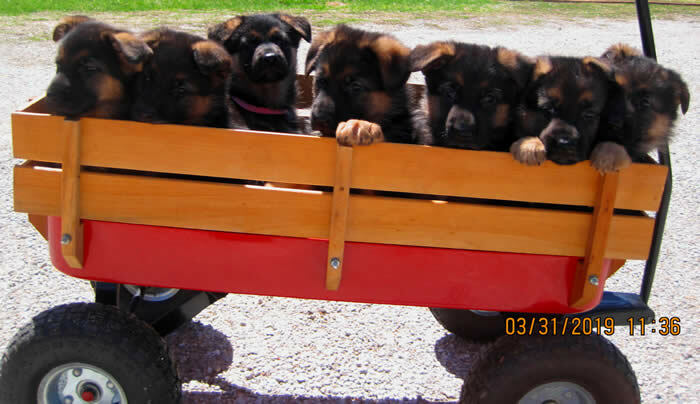 4 week old FEMALE pups from left to right..black, orange, pink, purple, and yellow collar female pups. 3/15/19. 4 week old FEMALE pups. 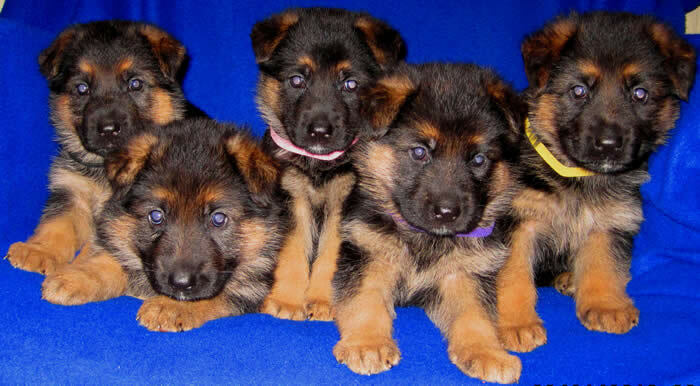 L to R..black, orange, pink, purple, and yellow collar female pups. 3/15/19. 4 week old FEMALE pups. 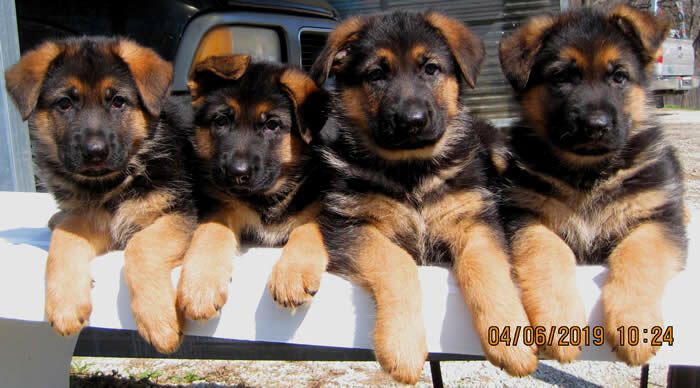 L to R..black, orange, pink, purple and yellow collar female pups. 3/15/19. 4 week old FEMALE pups. Look how BIG they are !!! 3/15/19. 4 week old MALE pups. 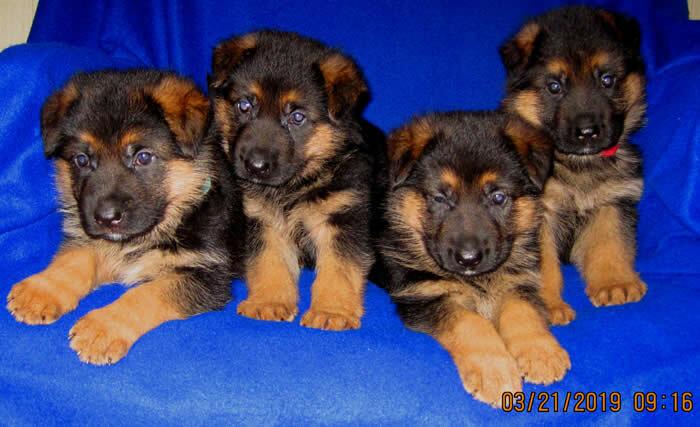 L to R..blue, brown, green and red collar male pups. 3/15/19. 4 week old MALE pups. 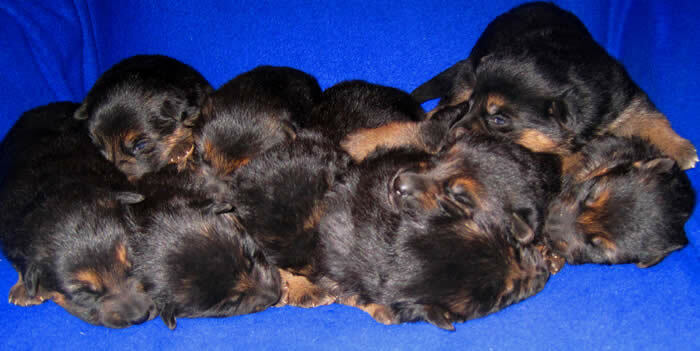 L to R..blue, brown, green and red collar male pups. 4 week old MALE pups. 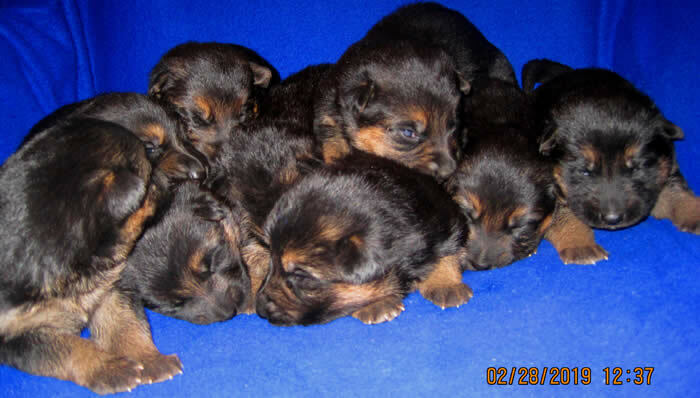 L to R..blue, brown, green, red collar male pups. 4 week old MALE pups. 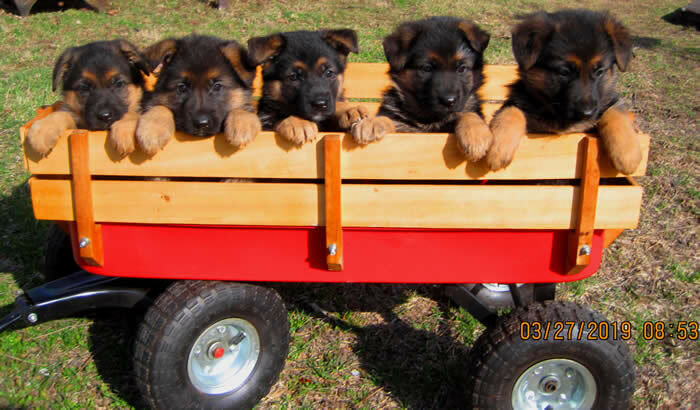 L to R..blue, brown, green and red collar pups. As you can see they are getting tired of the photo shoot. LOL. Olivia my 4 year old grand-daughter-proud of her "puppies"
Puppies @ 3 weeks old. Photo taken 3/10/19. Olivia pre-spoiling the puppies. 3/10/19. 3 week old FEMALE pups. 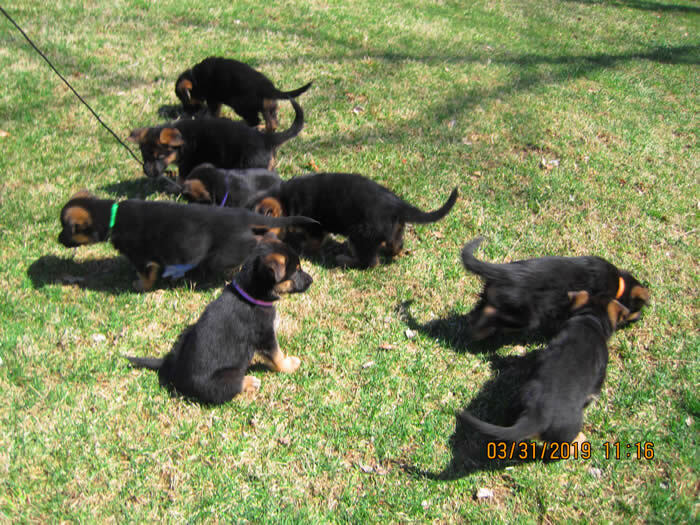 Left to right, black, orange, pink, purple and yellow collar female pups. Pic taken 3/07/19. 3 week old MALE pups. 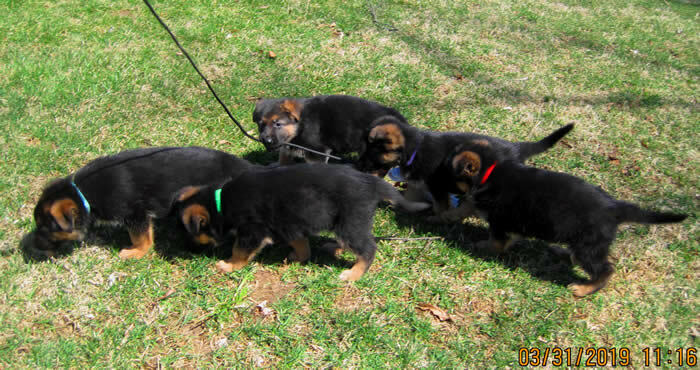 Left to right, blue, brown, green and red collar male pups. Pic taken 3/07/19. 3 week old FEMALE pups. 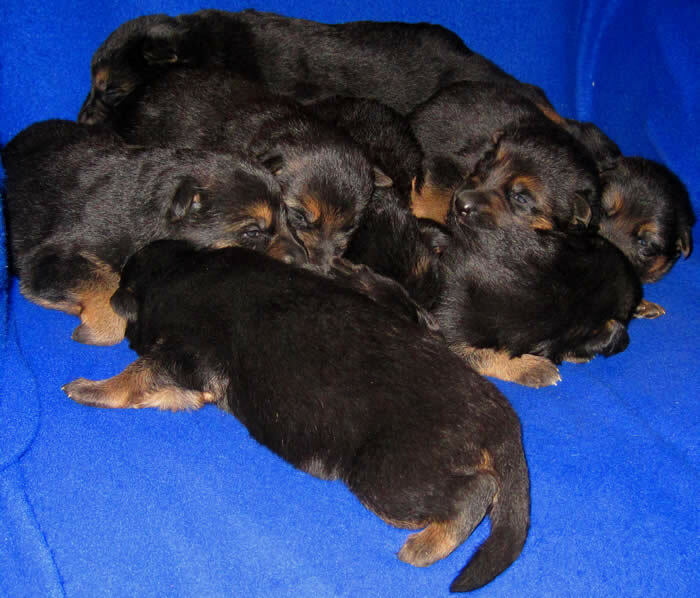 Left to right, black, orange, pink, purple, and yellow collar female pups. 3 week old MALE pups. 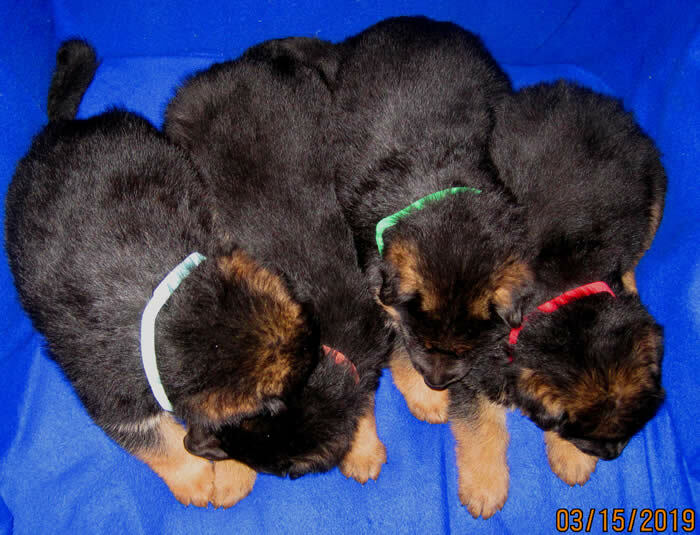 L to R. blue, brown, green and red collar male pups. 3 week old FEMALE pups. 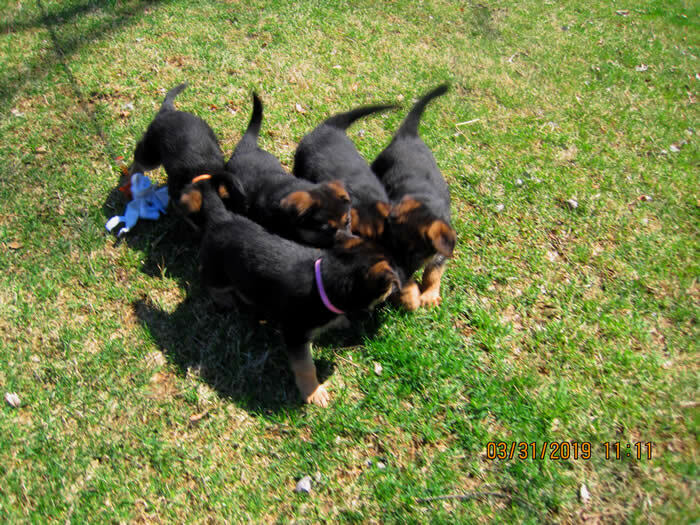 L to R. black, orange, pink, purple & yellow collar female pups. 3 week old FEMALE pups. 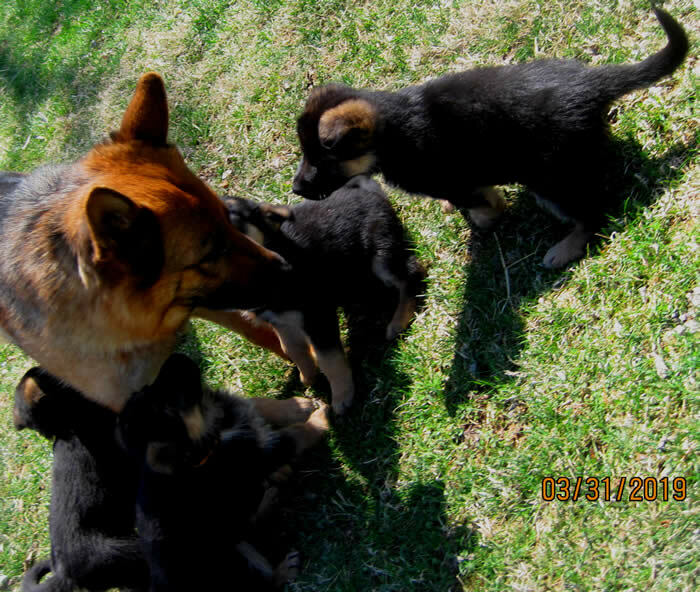 L to R. black, orange, pink, purple and yellow collar female pups. 3 week old FEMALE pups. 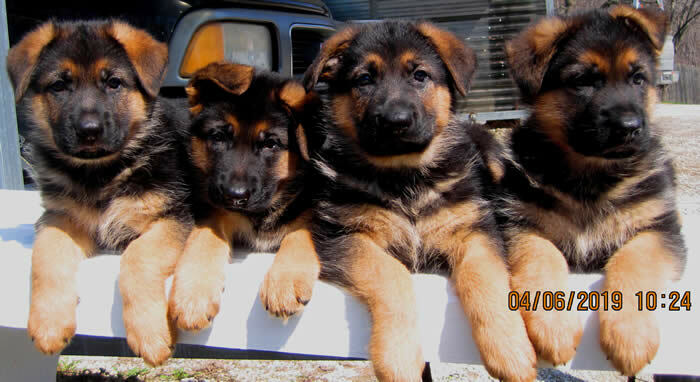 L to R..black, orange, pink, purple and yellow collar female pups. 3 week old MALE pups. 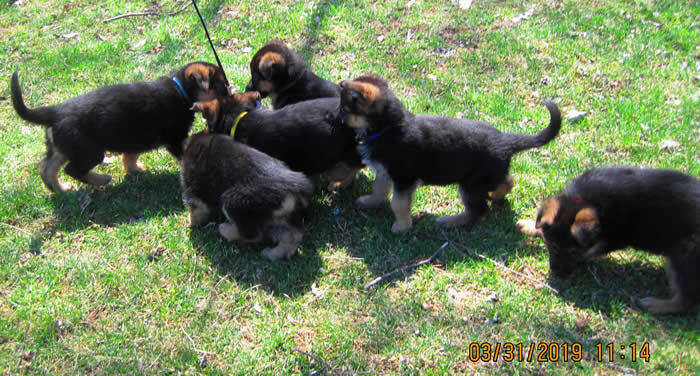 L to R..blue, brown, green and red collar male pups. 3 week old FEMALE pups. 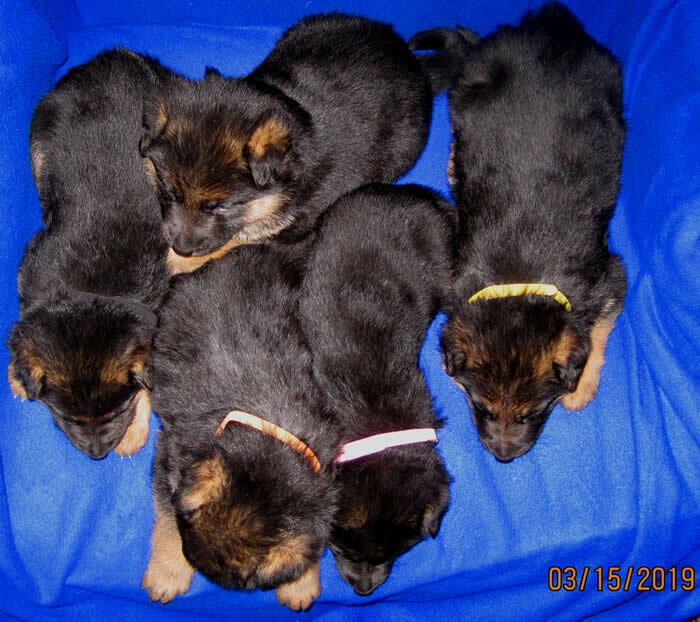 L to R..black, orange, pink, purple, and yellow collar female pups. 3 week old female pups. 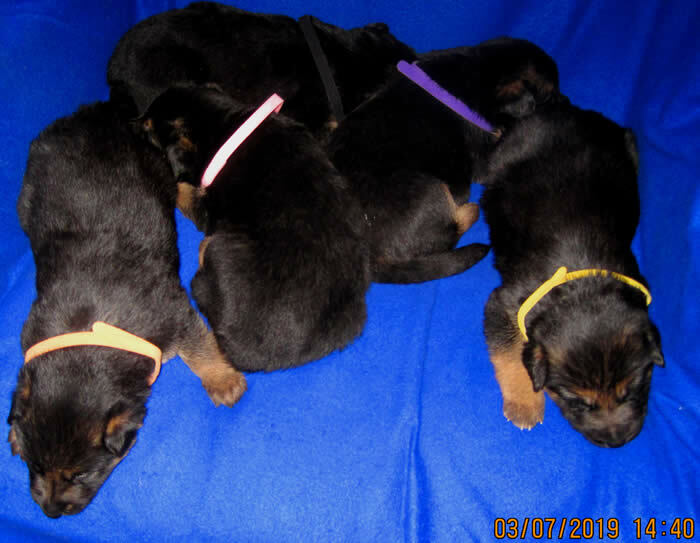 Black collar in the back, L to R..orange, pink, purple and yellow collar female pups. 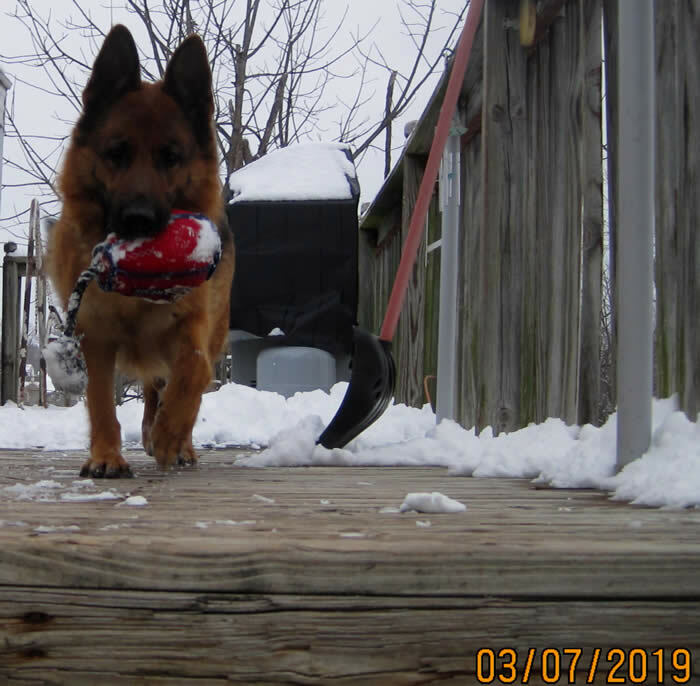 Ava says lets play and STOP working so hard--shoveling all that snow. Lol. Ava says please lets play some more! She's looking down at her toys. LOL. Ava says hurry up mom its play time!!! Here's a sample of the puppy collar that you'll want to bring...12-14" buckle collar. 2 week old puppies! 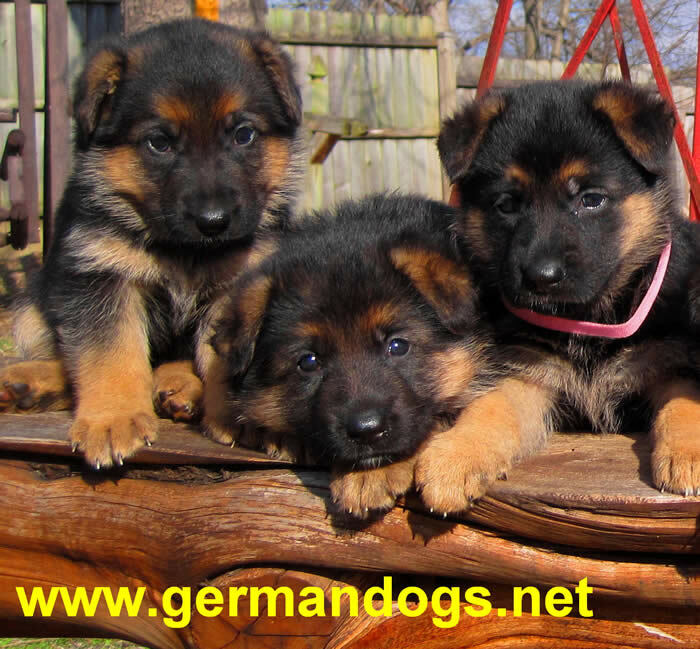 Beautiful Black and Red German Shepherd Pups! Photo taken 02/28/19. They are getting BIG! They are doing GREAT !!! 1 week old puppy pics taken 02/21/19. They are doing great, they were micro-chipped today and they each weighed in over a pound and a half each !!! 1 week old puppy pics. 2/21/19. 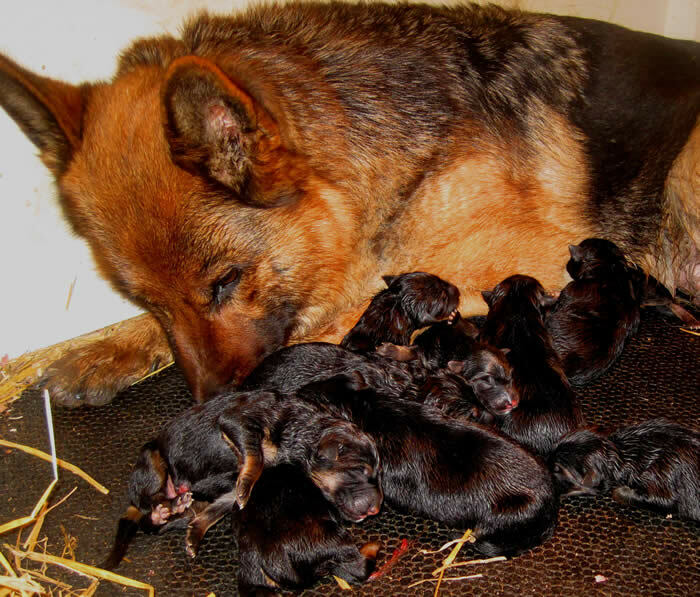 Photo of Ava and her 11 puppies, 6 boys and 5 girls born. 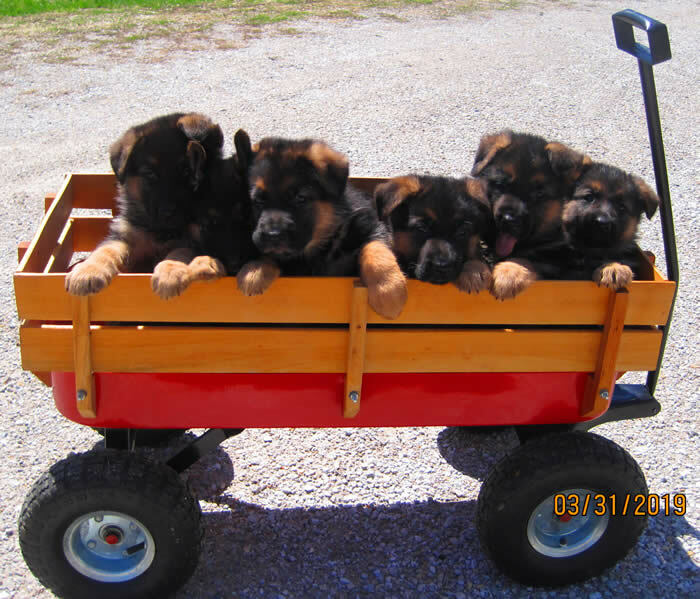 We have puppies for sale at this time!!! They won't last long !!! 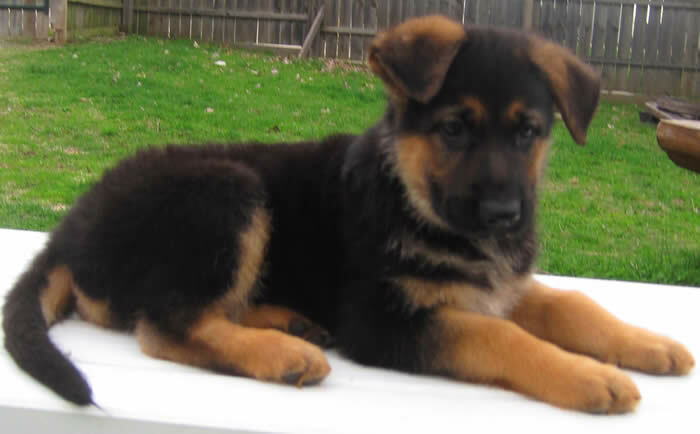 Reserve your puppy today !!! 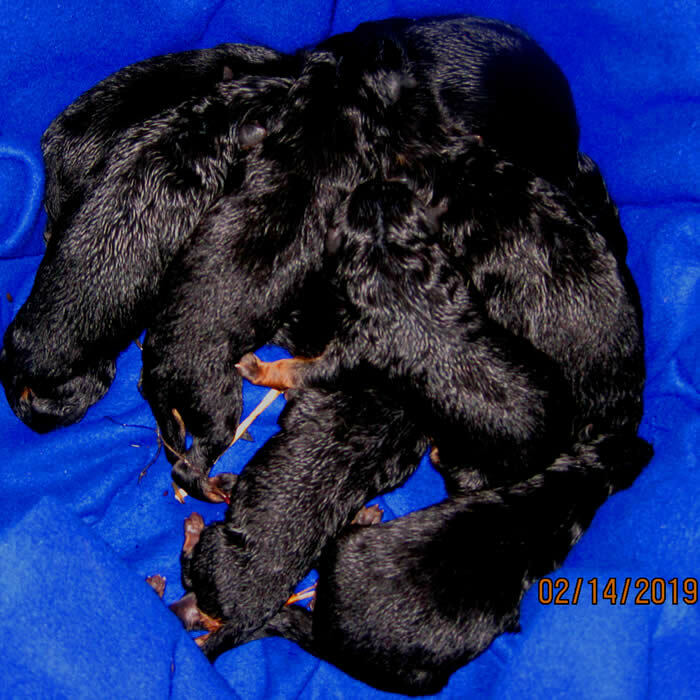 Photo taken 02/14/19, newborn Valentines Day Puppies.